An ambivalent forecast for today, you know the kind, the ones which mention low cloud, possibly a shower somewhere or other, maybe an occasional glimpse of the sun depending on where you happen to be. 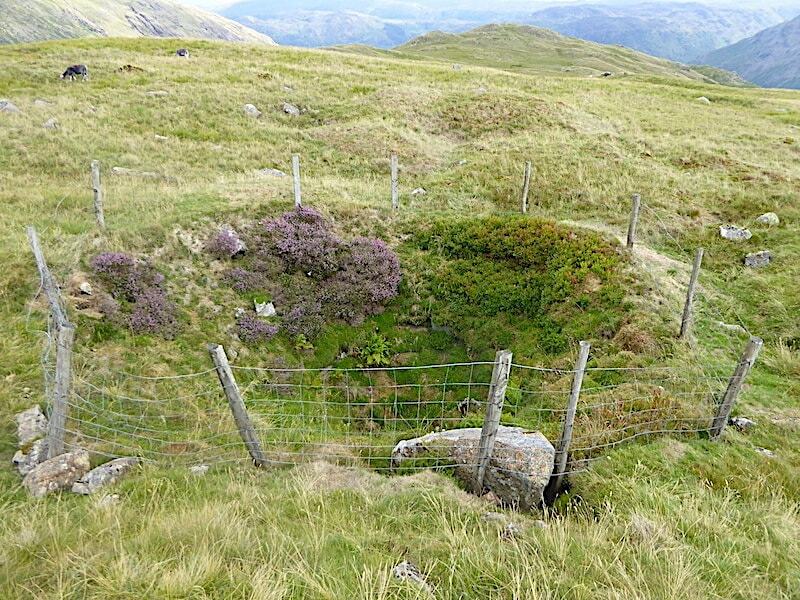 So with everything on the vague side we thought we’d go and explore the wad mines above Seathwaite. Not high enough to be smothered in cloud, close enough to return to the car should the rain start hammering down, and a reasonable sort of day to go and have a look at one of those places that you’re always going to visit but somehow never get round to doing so. 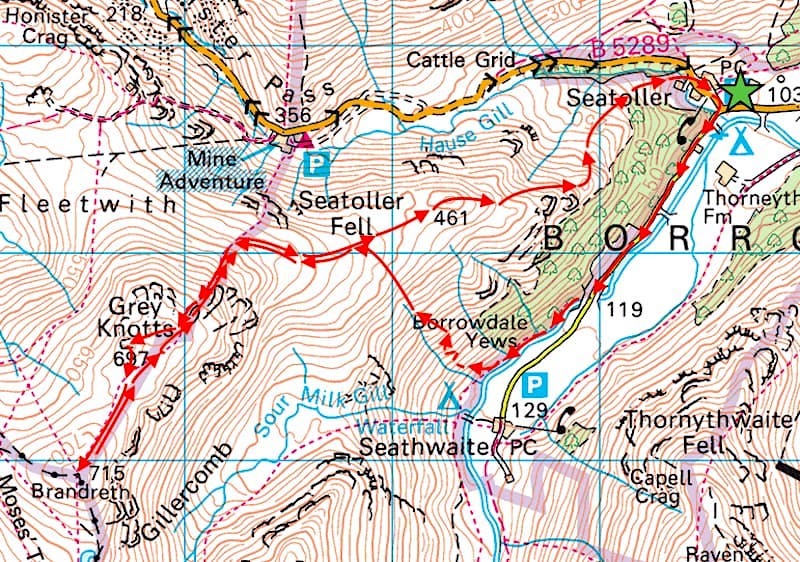 As things turned out we ended up going over to Grey Knotts and Brandreth as well and returned to Seatoller via Seatoller Fell. More than we’d planned to do but as the opportunity arose it seemed foolish not to take advantage of it. A very dull, overcast and humid morning as we leave the car park in Seatoller. 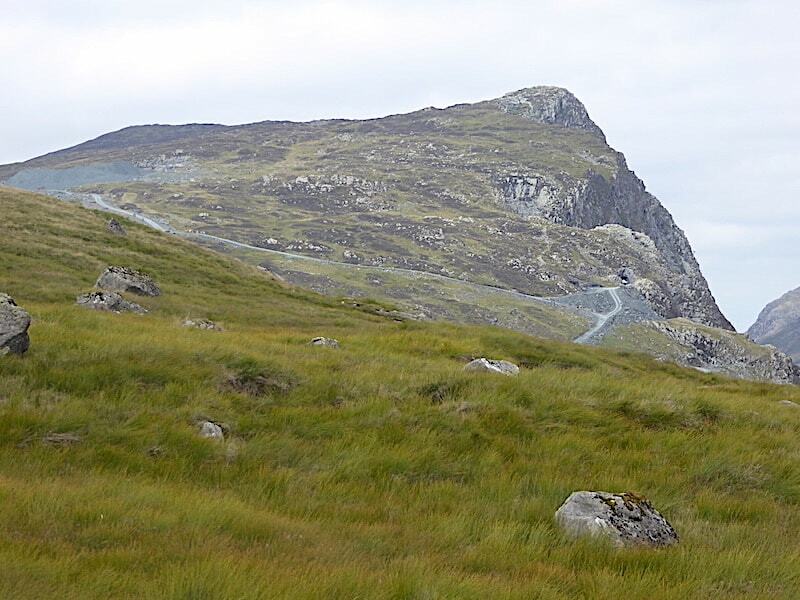 Base Brown ahead of us as we walk the lane leading to Seathwaite Farm. 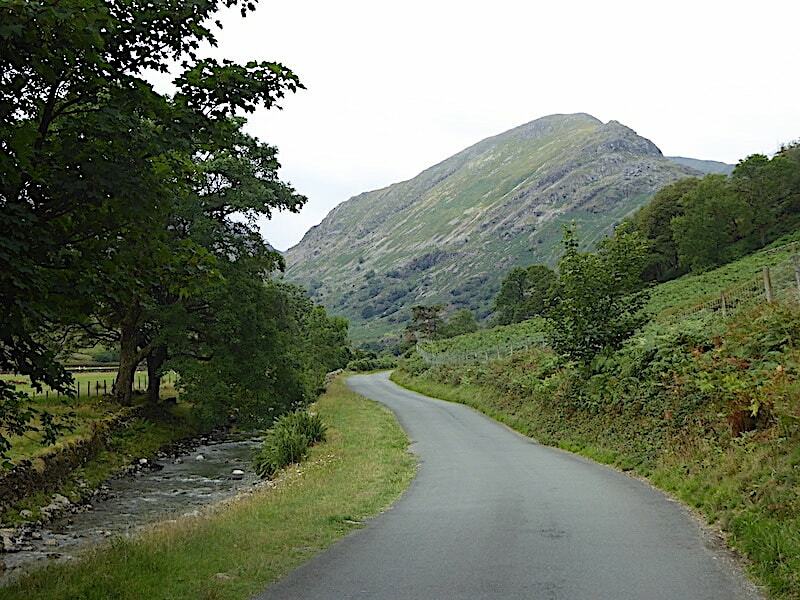 A friend of ours spotted us as he was driving up towards the farm so we had a quick chat, he was off up to Scafell Pike so he had a long walk and a huge amount of ascent ahead of him. Cars were coming up behind him so he had to get on his way. Looking ahead I could see nothing but cloud over the higher fells and wondered if it would eventually clear for him to be able to enjoy the fabulous views from up there. 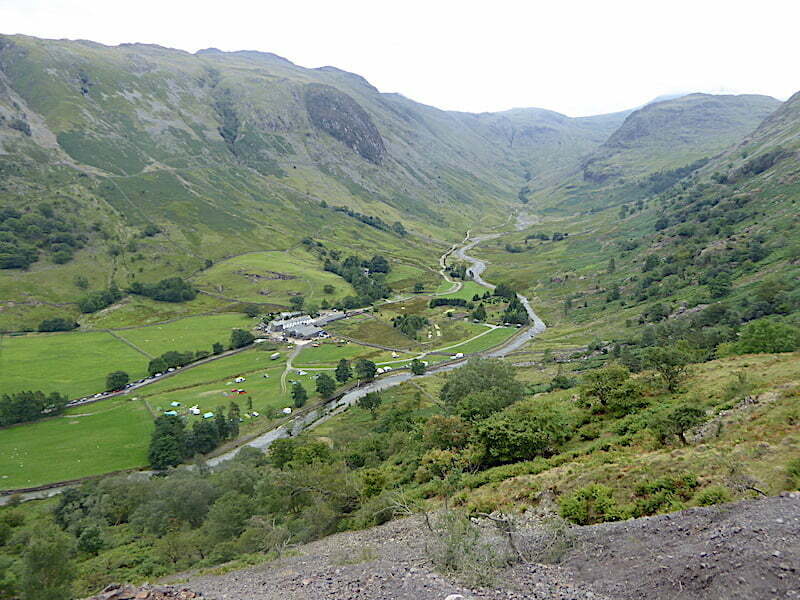 Our spell of road walking came to an end at Seathwaite Bridge where we branch off to the right and pass through the gate to walk along the riverside path. It was a relief to leave the road as cars were constantly passing us and heading towards the farm. 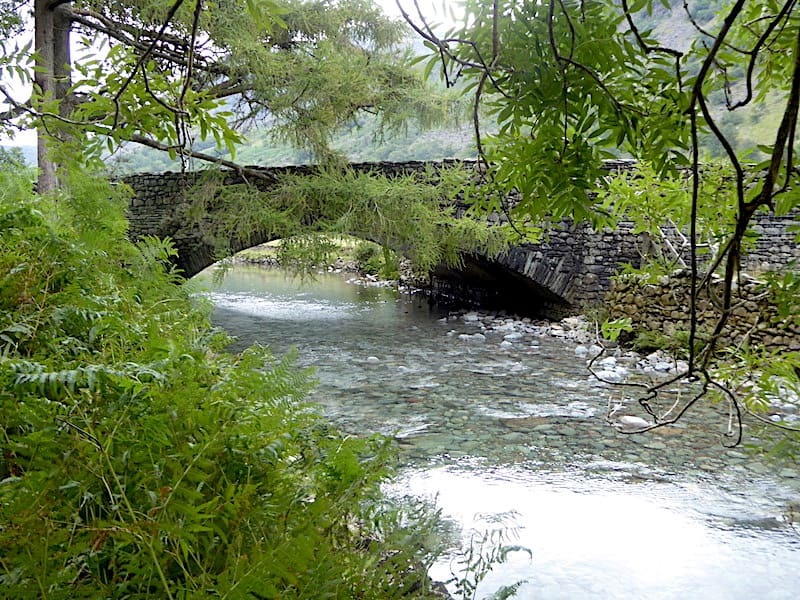 A look back at Seathwaite Bridge as we walk the peaceful, and deserted, riverside path. Plenty of water in the river now but a couple of weeks ago all that could be seen were the parched dry stones of the river bed. 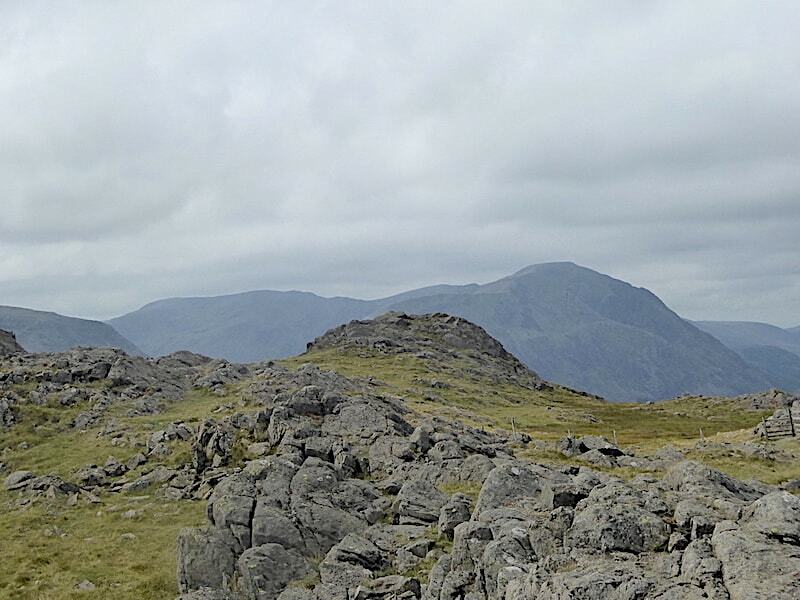 Base Brown straight ahead with Seathwaite Fell to the left, everything beyond those two was cloaked in cloud. A look back after passing through the wire fence. 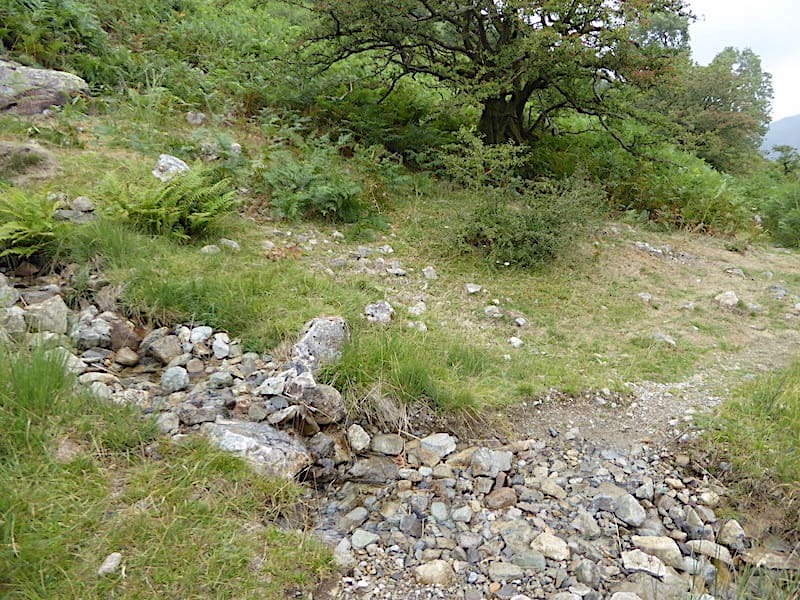 The path is quite rough in places along the way, but even worse though is the bracken. It may be starting to show signs of dying back but it is still very tall and dense. 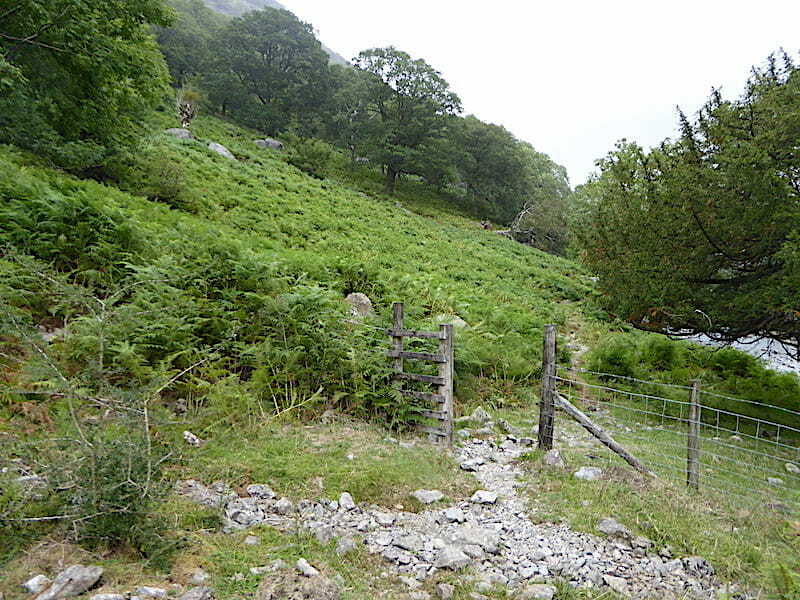 Just a very few paces beyond the gap in the fence a look up to our right indicates the notice board marking the location of the Borrowdale Yews …..
….. so we fight our way through the bracken and climb up to take a look at them and have a read through the information on the board. 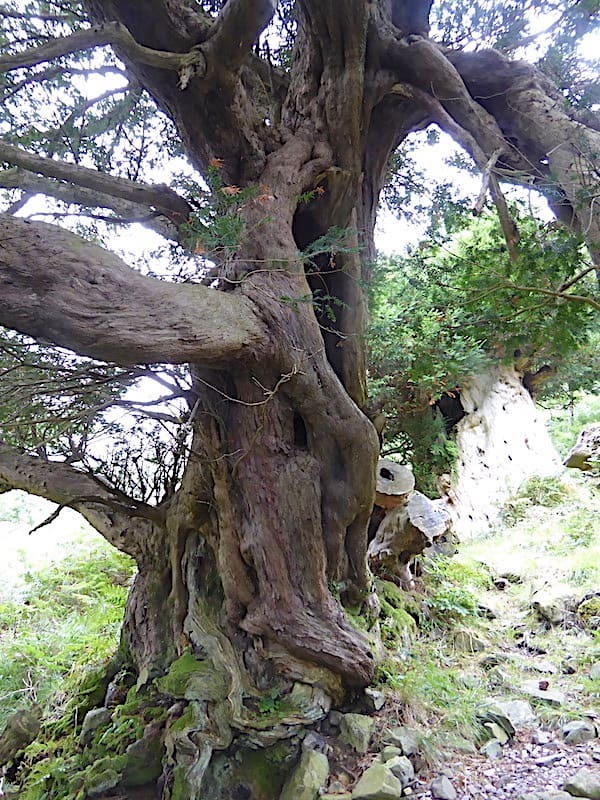 The first yew we reach is spectacularly convoluted, primeval almost, and the silence in this little grove only added to the aura of other-worldliness. We walk half a dozen paces further on to take a look at the second of the ‘fraternal four’. 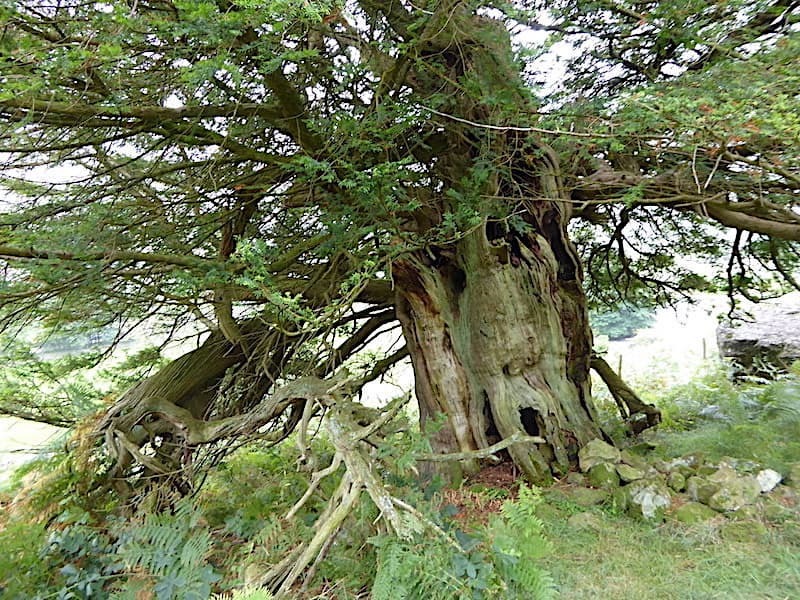 Having been dated in 2004 as being over 1500 years old these trees were already ancient when Wordsworth penned his Yew-Trees poem, but they have the remarkable ability to sprout new growth as the trunk gradually decays. 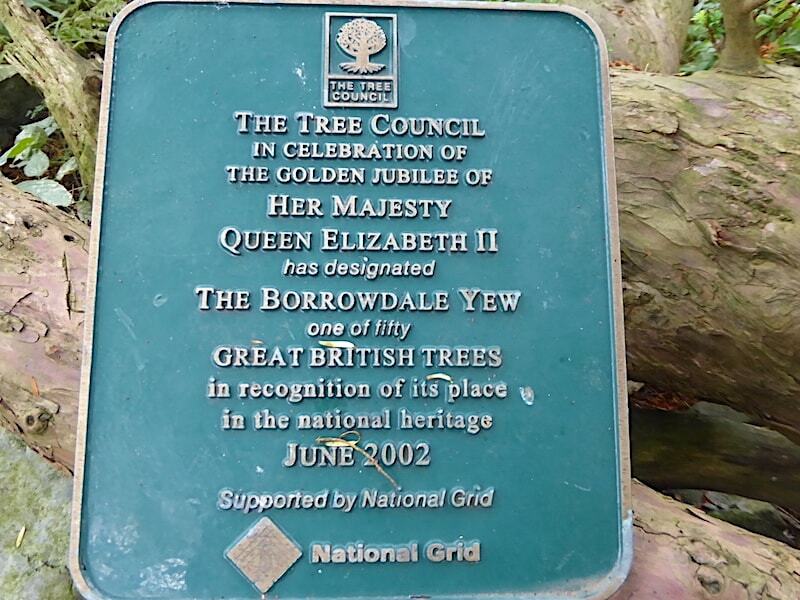 A view of the first tree that we came to with the blue Tree Council plaque attached to the branch down at ground level. 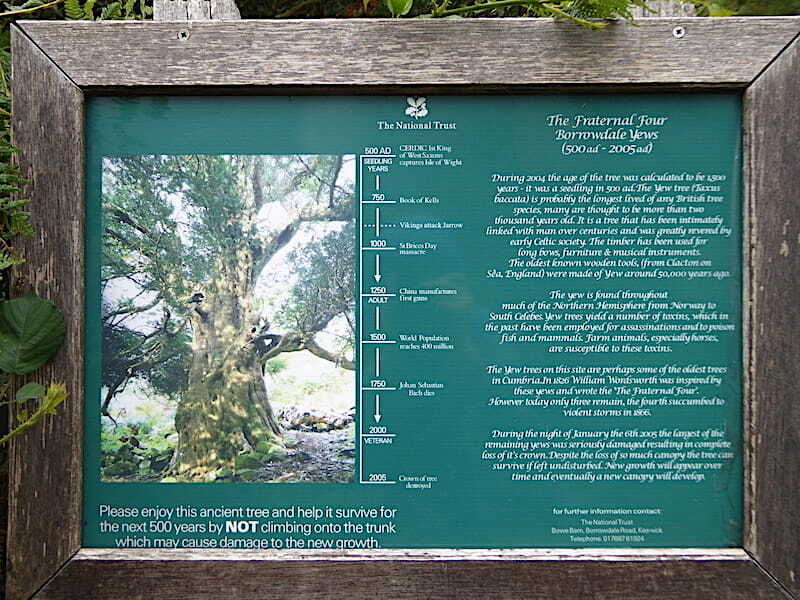 From the first two a short track leads us over to the third yew which is no less spectacular than the previous two. 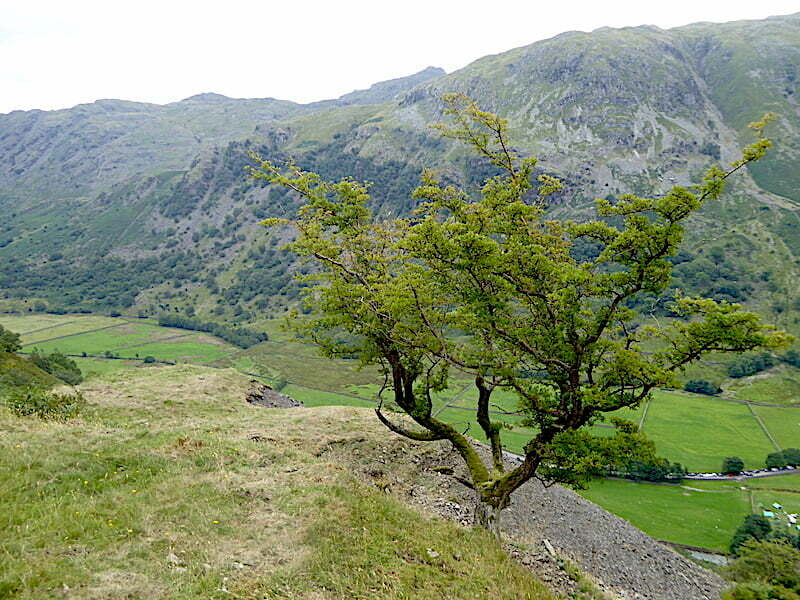 Of Wordsworth’s original ‘fraternal four’ only these three remain in this little grove. 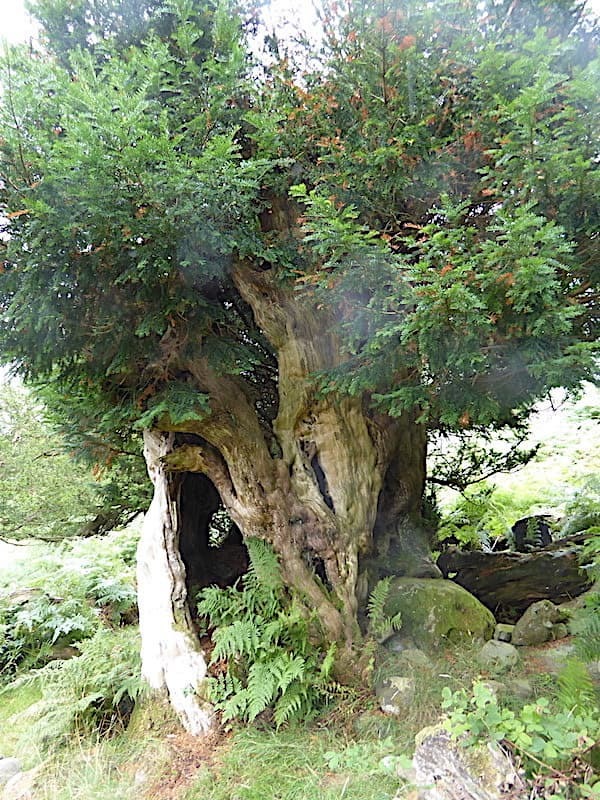 The fourth was uprooted in a storm in 1866, and subsequent storms have wreaked havoc on the other three but they continue to thrive and cast their magic on anyone who cares to visit them. 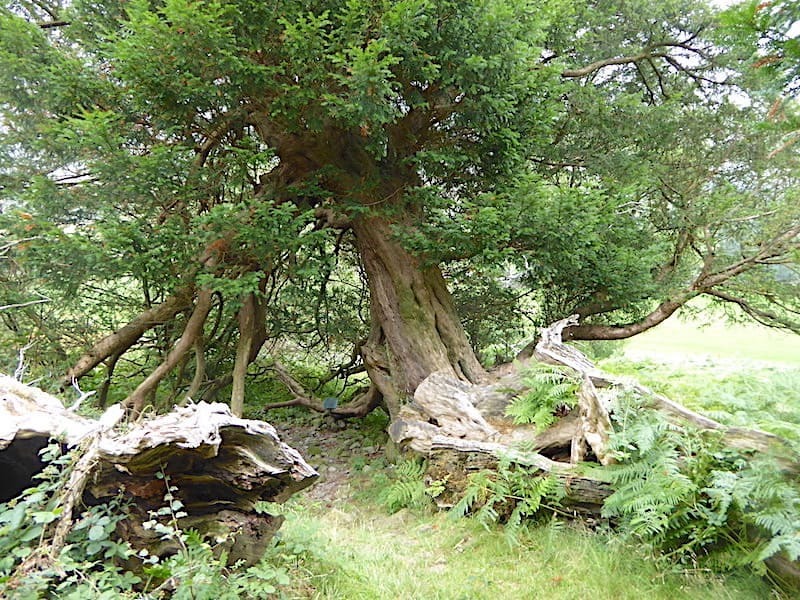 There are other yews close by but are mere babies in comparison, probably no more than a handful of hundreds of years in age. Its a sobering thought that, storms permitting, they will still be growing here well beyond the life span of everyone living on earth today, its not by chance that they feature so often in our churchyards as a symbol of eternal life. 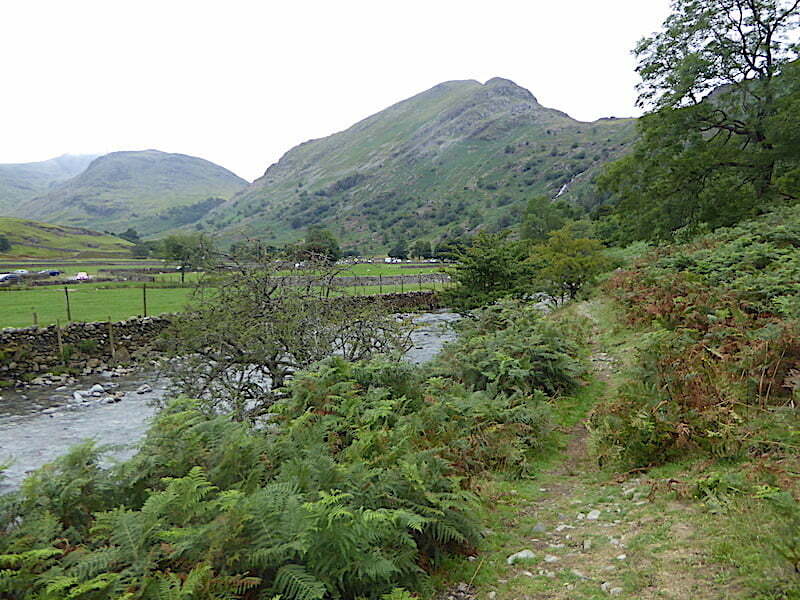 We fight our way back down through the bracken and carry on a little further along the riverside path until we reach the almost indistinguishable track beside Newhouse Gill. 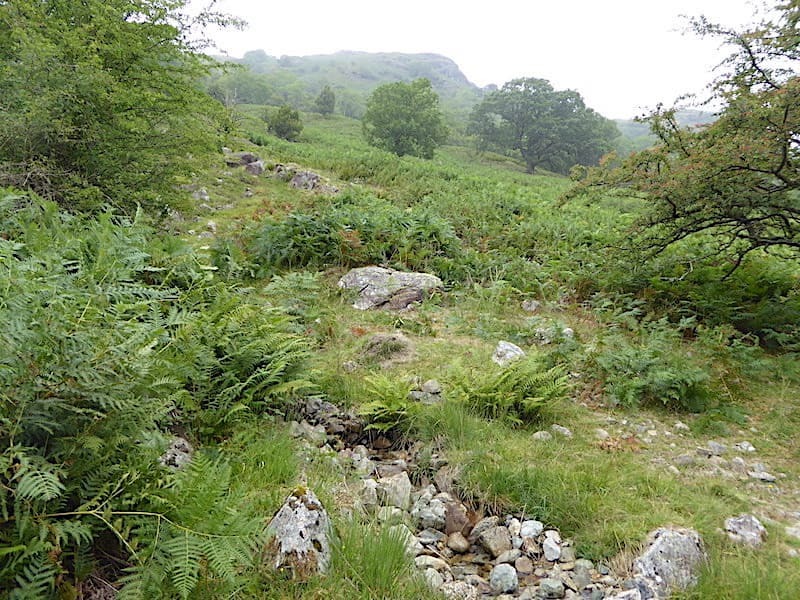 From the same spot a look up the gill to see the path disappearing into the tall bracken. 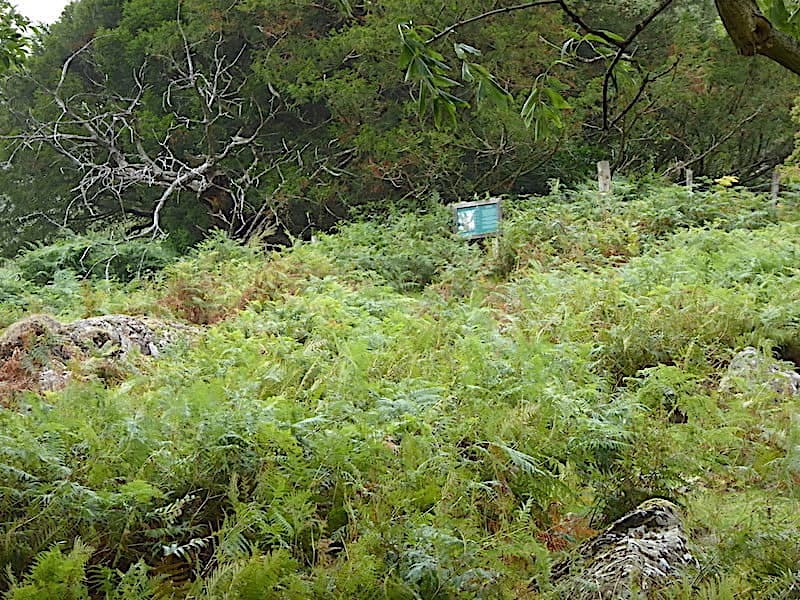 This hillside is steep enough to deal with without also having to fight our way through the bracken. Right, time to gird the loins and get on with it then. 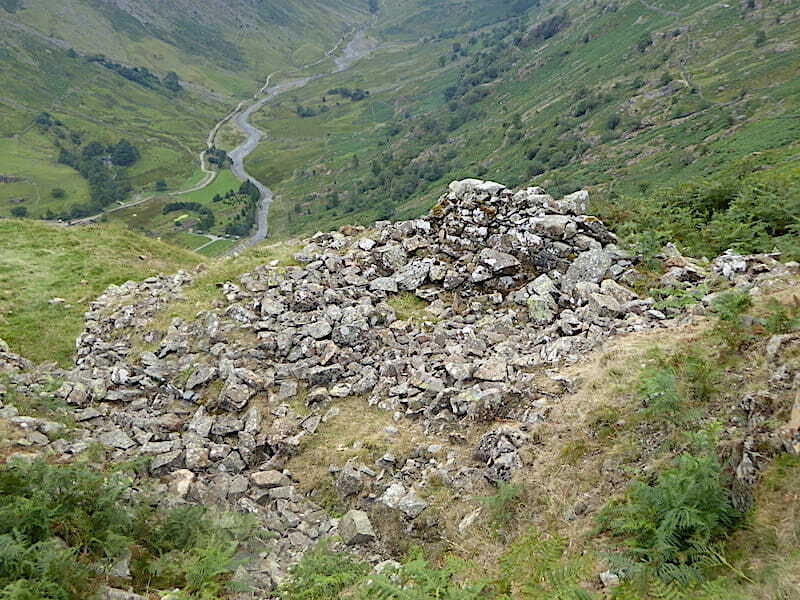 After a steep, hot and sweaty climb in high humidity we reach the first big spoil heap, at what I think is Gilbert’s Level, with the amazing view of Seathwaite Farm and Grains Gill far below us. 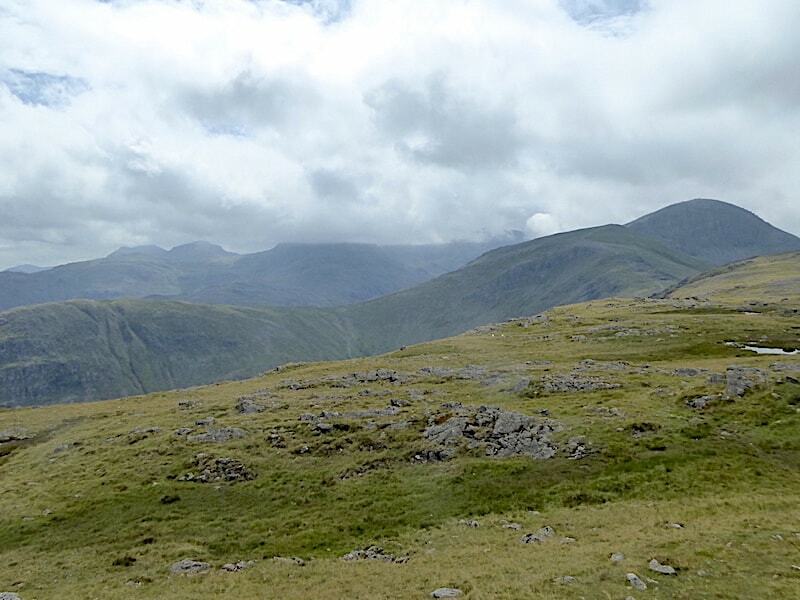 Plenty of camping activity going on down there by the look of things. 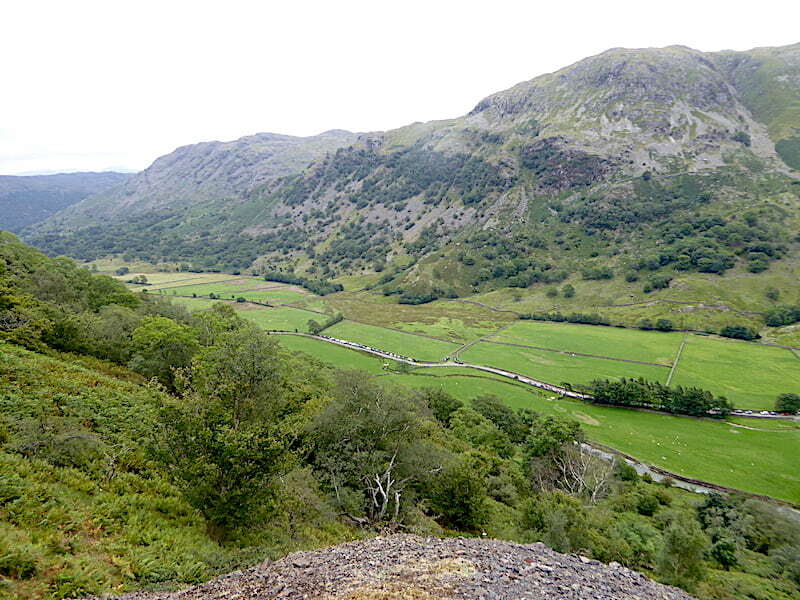 I’m not into camping but even if I was Seathwaite wouldn’t be high on my ‘favourite places to pitch my tent’ list, it does have a reputation for being one of the wettest places in England. Looking back along the valley with a view of Thornythwaite Fell across from us. In the valley the usual, and seemingly endless, line of vehicles parked along the lane, whose occupants will by now be walking over some crowded routes towards their various destinations. 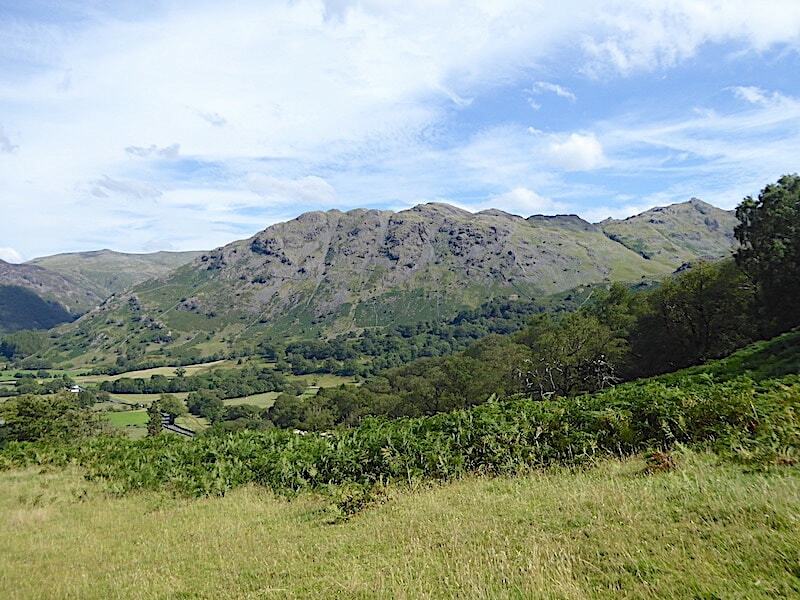 We like to leave Seathwaite to weekenders and holidaymakers at this time of year and take our walks from here in the quieter off-season period. 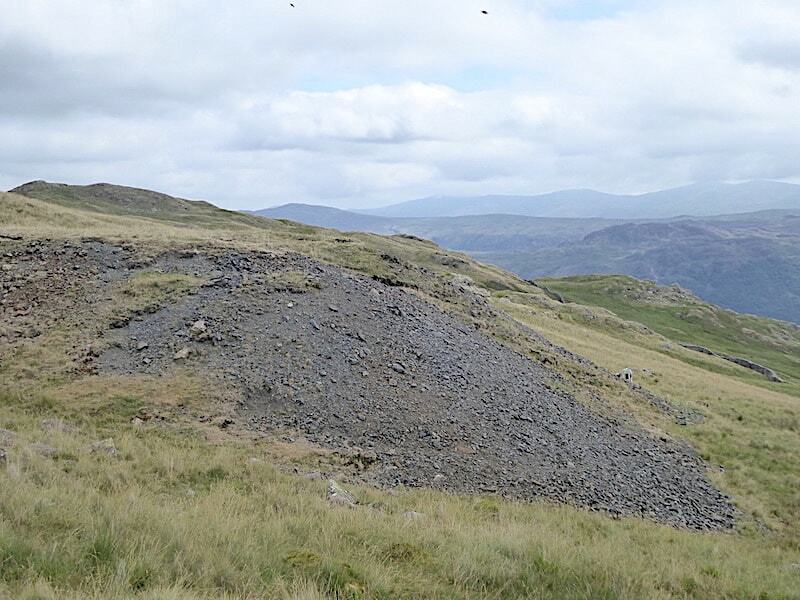 A look over to Base Brown from the grassy top of the spoil heap at Gilbert’s Level, the skies still dull and overcast. 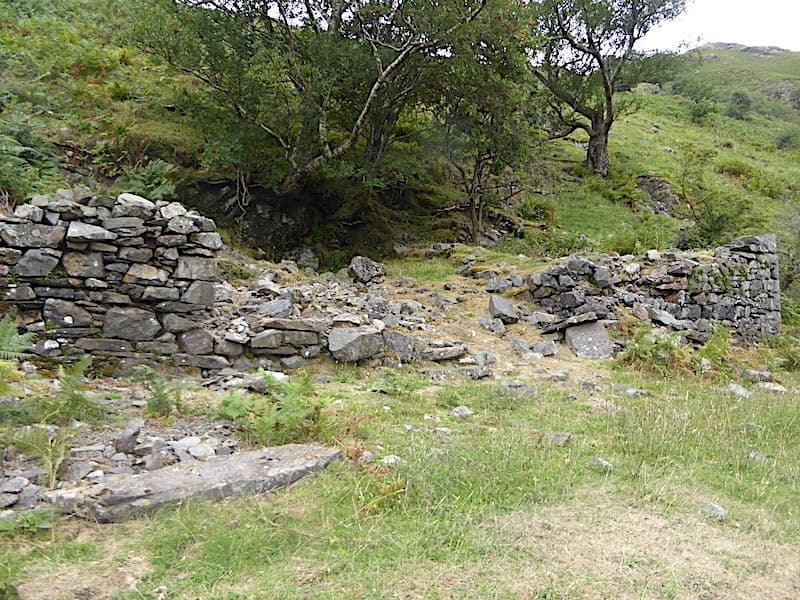 The remains of a former guardhouse at Gilbert’s Level …..
….. and a peep down at what the former guardhouse formerly guarded, a mine entrance. 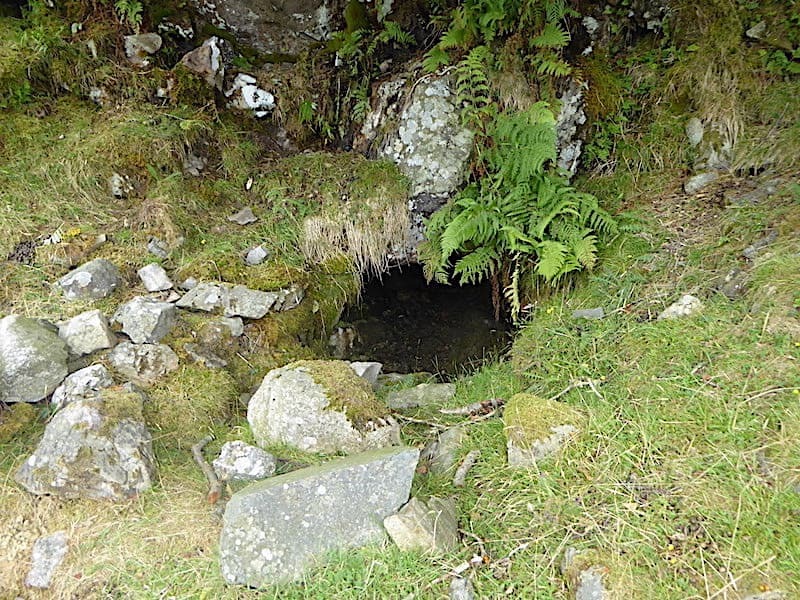 The substance which was mined here had many names, wad, plumbago, black cawke, black lead, graphite but, however it was referred to, what never changed was its high quality and thus its value. Its high value meant that miners were closely watched as they worked, and then searched when the day’s work was over. 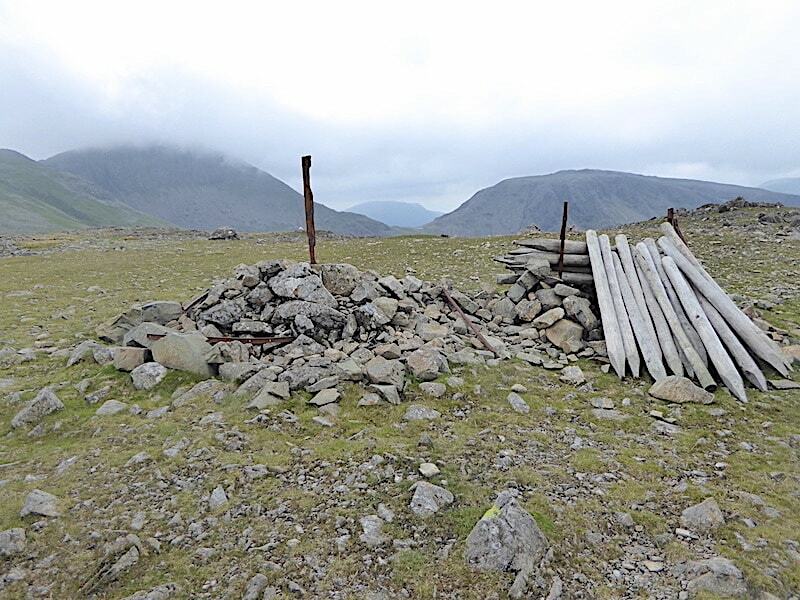 The manned guardhouses were constructed over a mine’s entrance which could only be accessed through a trap door in the floor of the guardhouse. 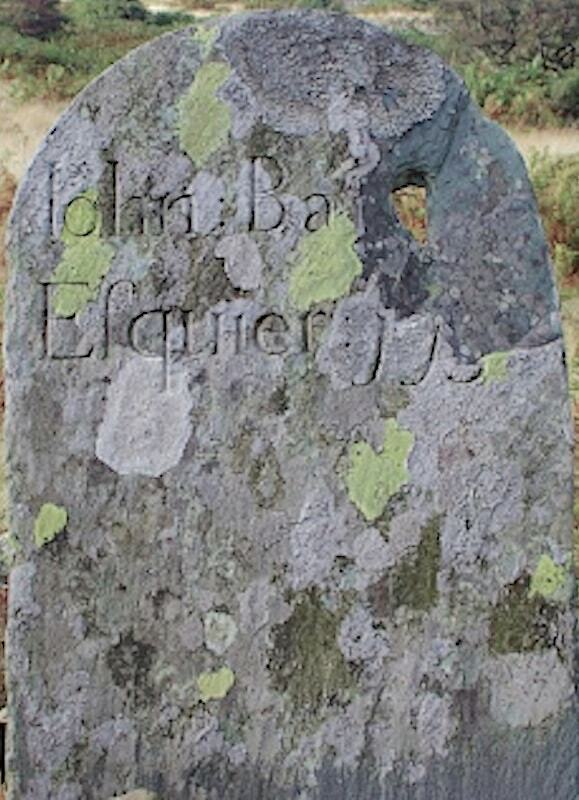 Nearby is the lichen covered boundary marker of the owner of one of the mines, John Bankes, Esquire. 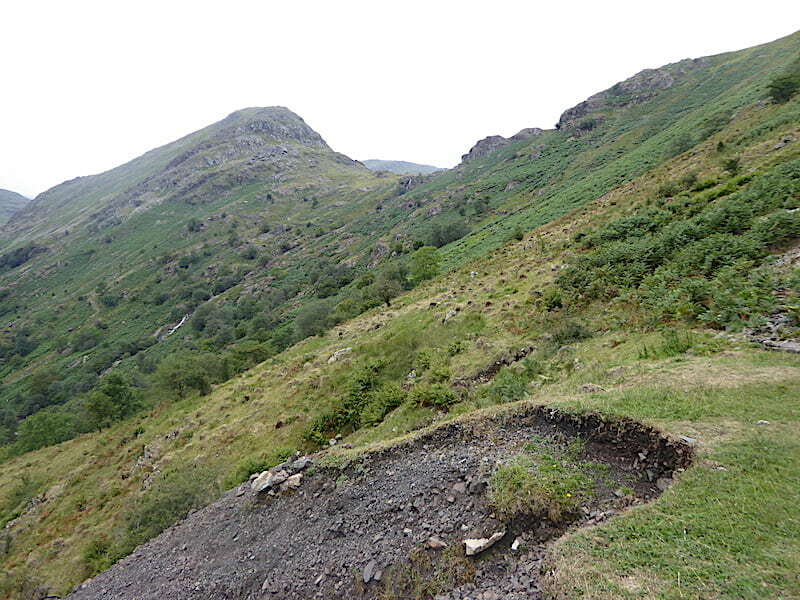 In 1752 an Act of Parliament made unlawful entry into a wad mine a crime, punishable by seven years transportation, and five such markers were erected around the mining area in the same year to warn potential trespassers. Apparently only three of the markers now remain. Up to the next level (Farey’s Level I think) with a view back down to Gilbert’s Level …..
….. and close by, a fenced off area preventing the unwary from falling into what looked like a very deep entrance, although the presence of small trees and bushes made it difficult to establish exactly what was lurking amongst them. Passing amongst the remains of more derelict buildings up we go to the next level. 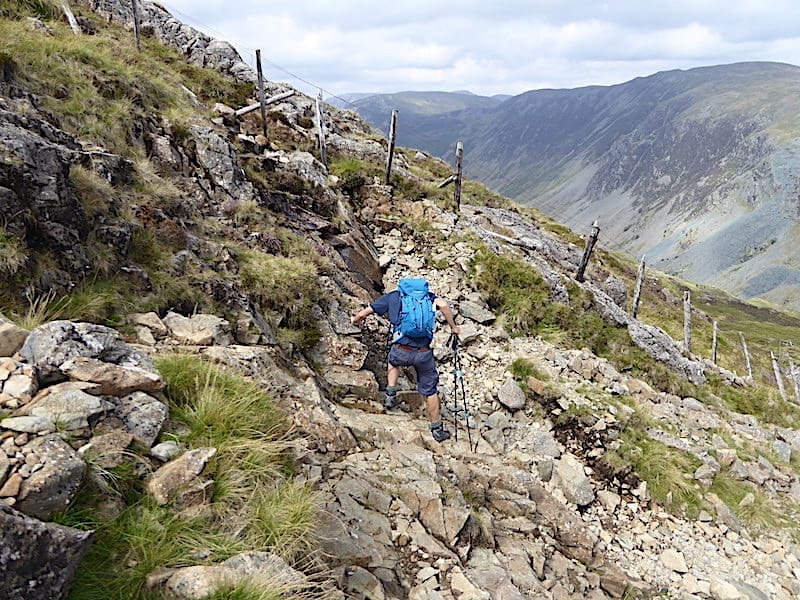 The tops of J’s walking poles are now at shoulder height rather than the usual waist height, the gradient on these slopes is very steep …..
….. as is evident from this look back down when we reach Harrison’s Level. 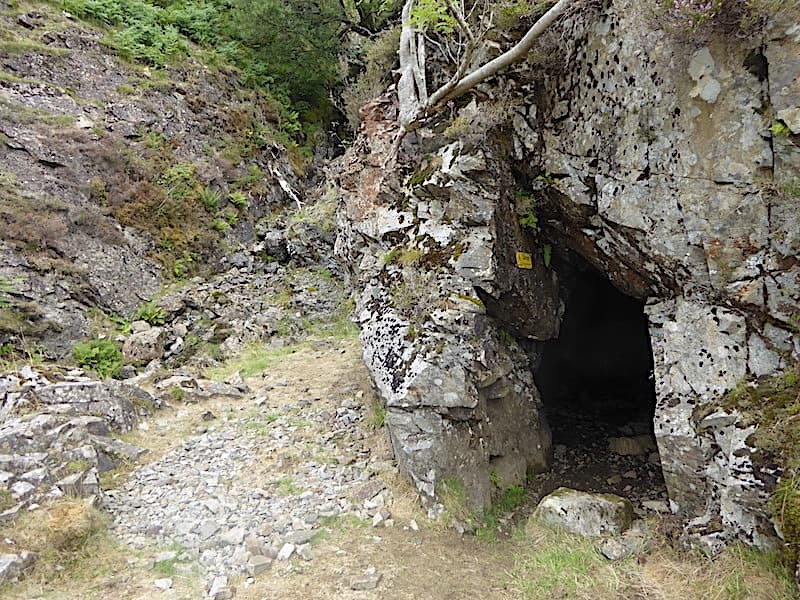 A little further around and we find another entrance, also sporting a yellow warning sign, with water constantly dripping onto the watery trackway below. Dark, damp, eerie and very uninviting so we turn around and make our way back to the more open area of the level. A jumble of derelict buildings remain which were probably once used for washing and sorting the wad. Easily extracted from the ‘pipes’ by hand, owing to its natural softness, the wad needed no other treatment than the removal of bits of stone and then being sorted by size. The washers and sorters were closely watched by overseers and were frequently searched as they worked and at the end of the day. The high quality wad would be worth around £13000 per ton in the 1760’s, (over £133,000 in today’s money) so even a couple of small lumps, tucked away in a pocket, might probably be worth more than the workmen’s annual earnings. The temptation must have been overwhelming, then again so would the thought of seven years transportation. 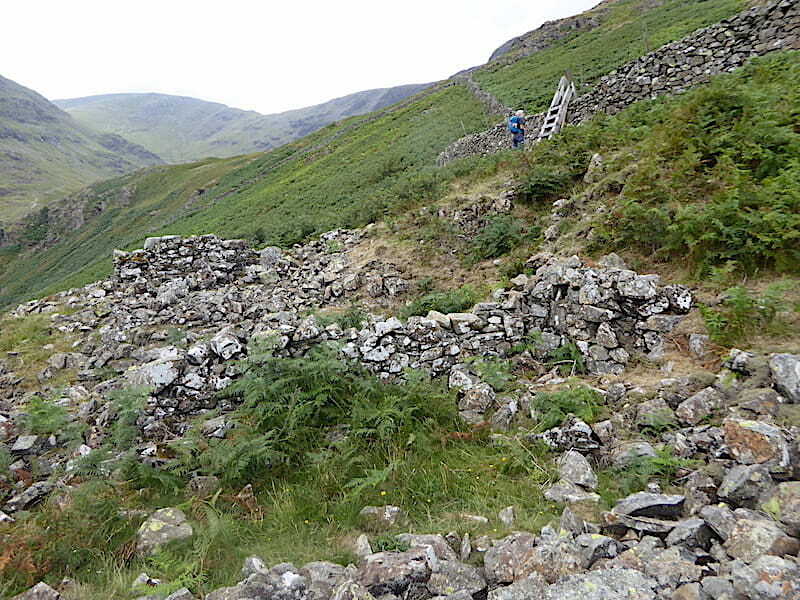 J waits patiently by the ladder stile while I potter around in the ruins, my imagination working overtime as I ponder upon the lives and times of all those who once laboured here. 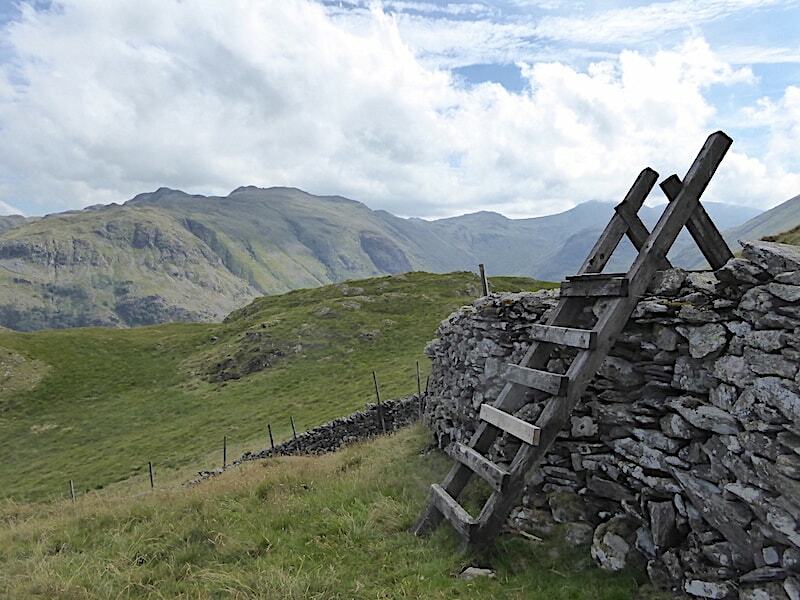 Over the ladder stile onto Seatoller Common where there are yet more workings and spoil heaps. Below us one of them contains the remnants of the old ladder stile, quietly rotting away amidst the debris. 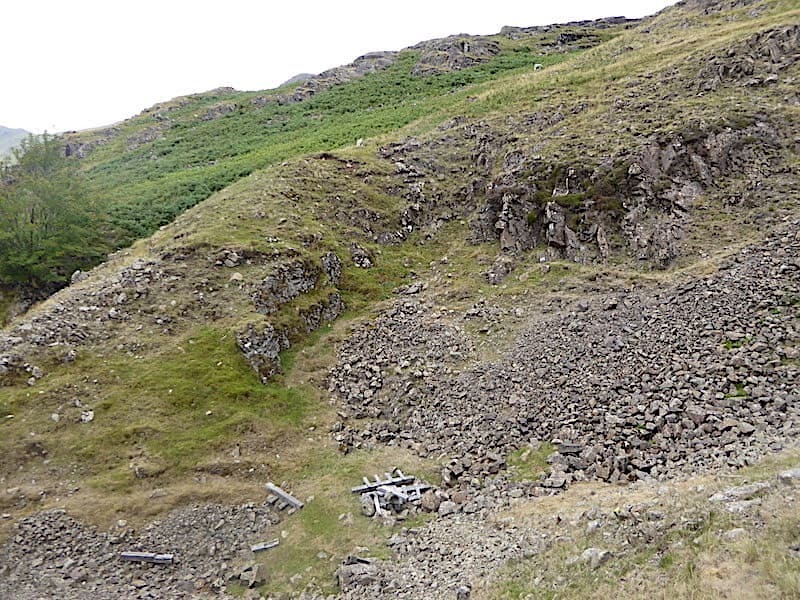 We continue climbing through the spoil heaps which gradually become …..
….. smaller and fewer as the ‘pipes’ lower down were gradually worked out and fresh ones searched for. 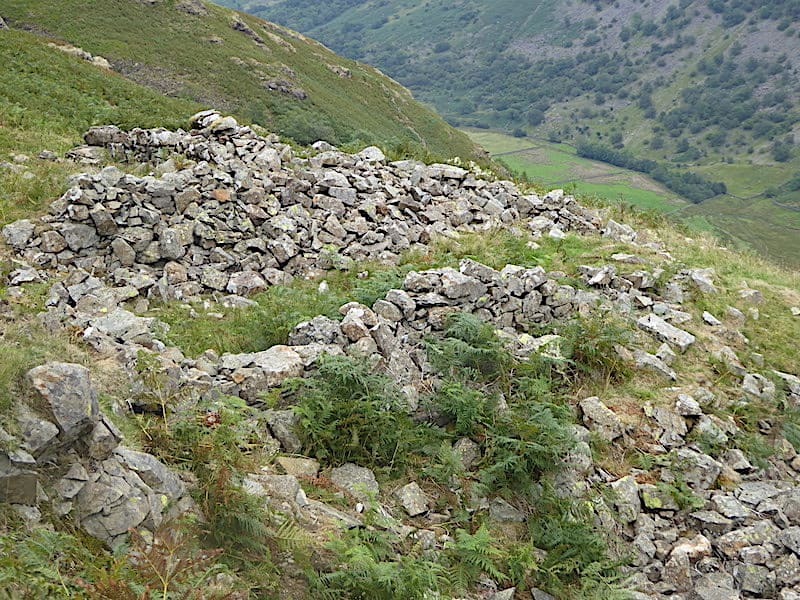 Eventually hopes of further finds receded and wad mining in Borrowdale came to an end in 1891 having been carried out periodically from the mid 16th century. 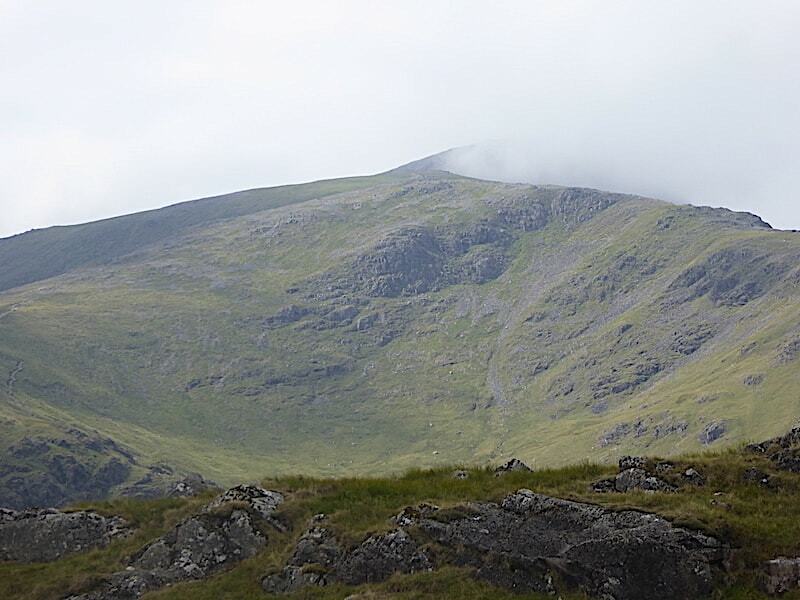 The cloud begins to break as we climb the gentler, and slightly damper, gradients of Seatoller Common. 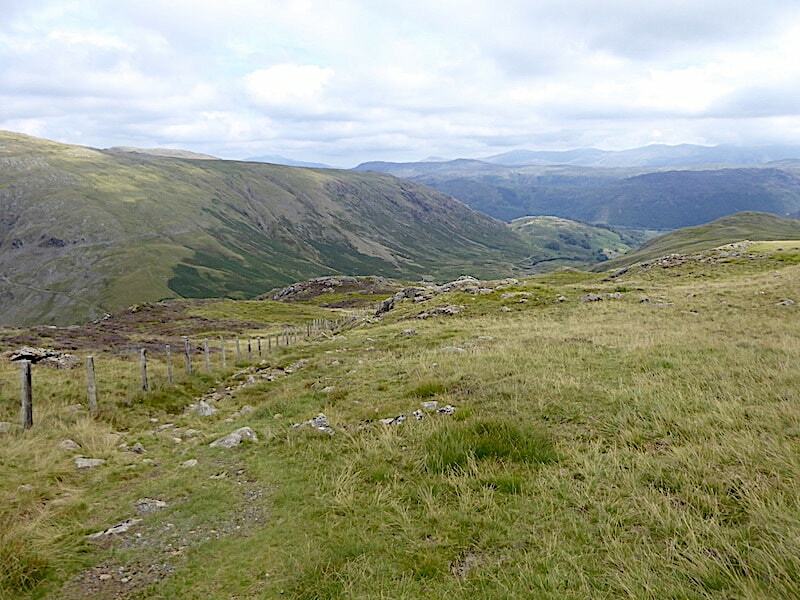 As it looks as though the day might develop into brighter weather we decide to continue across the Common and make our way over to the Grey Knotts path coming up from Honister Pass. 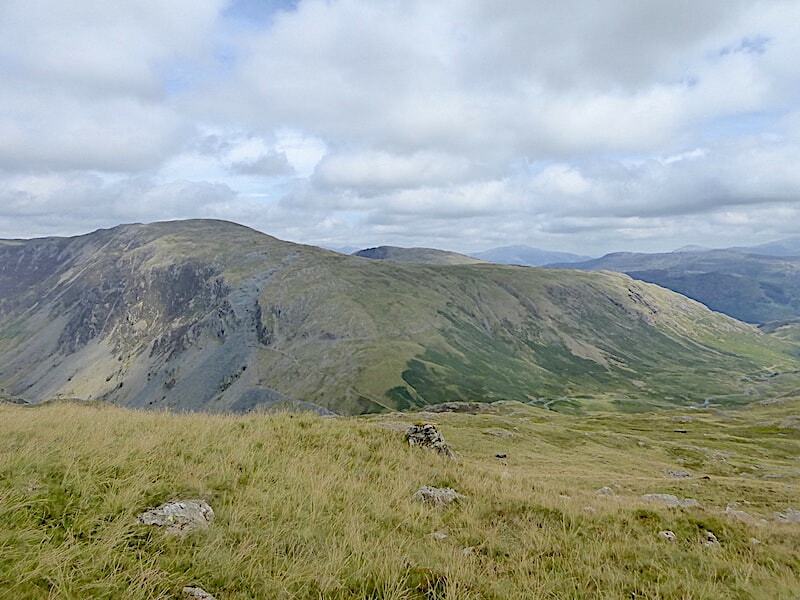 To our left we now have views of Base Brown, Green Gable, Brandreth. 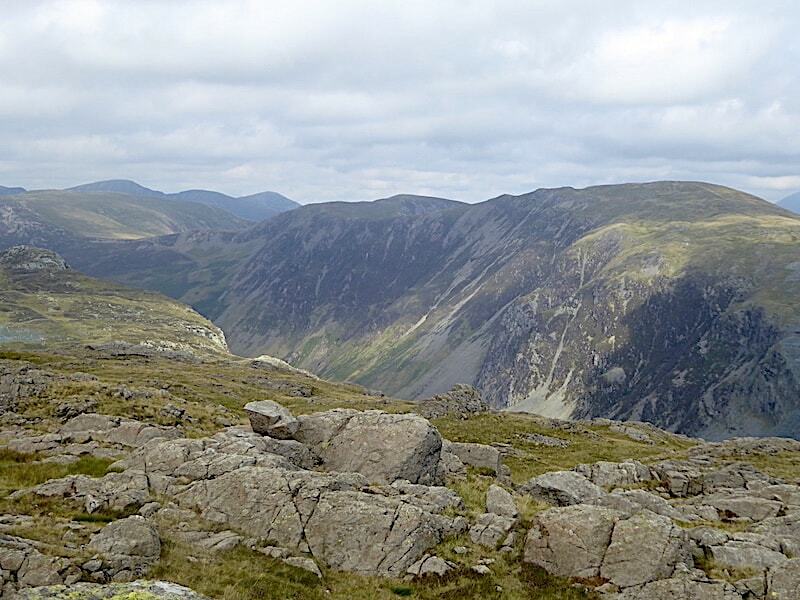 The large wall of rock on the right of the shot is Raven Crag, also known to climbers as Gillercomb Buttress. There’s a faint hint of sunlight on Base Brown as I take a closer look at it. 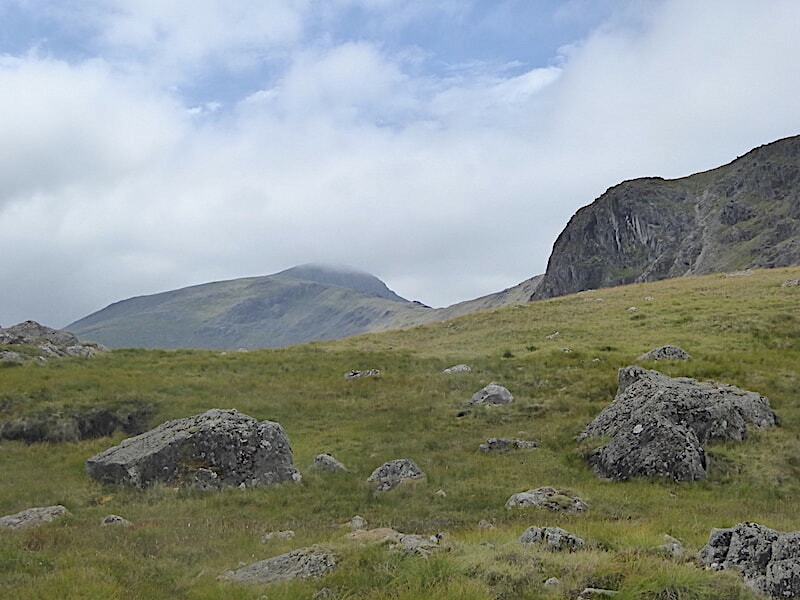 Green Gable also has a sunny spell although cloud is still obscuring any view of Great Gable behind it for the time being. 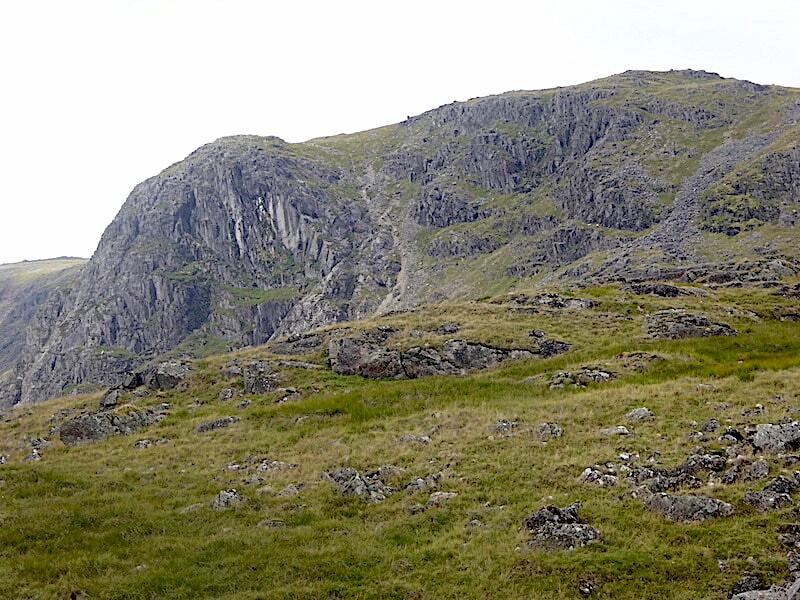 A closer look at Raven Crag where there seems to be a track curving around the side of it, or is it just a fall of scree? Difficult to tell from over here. 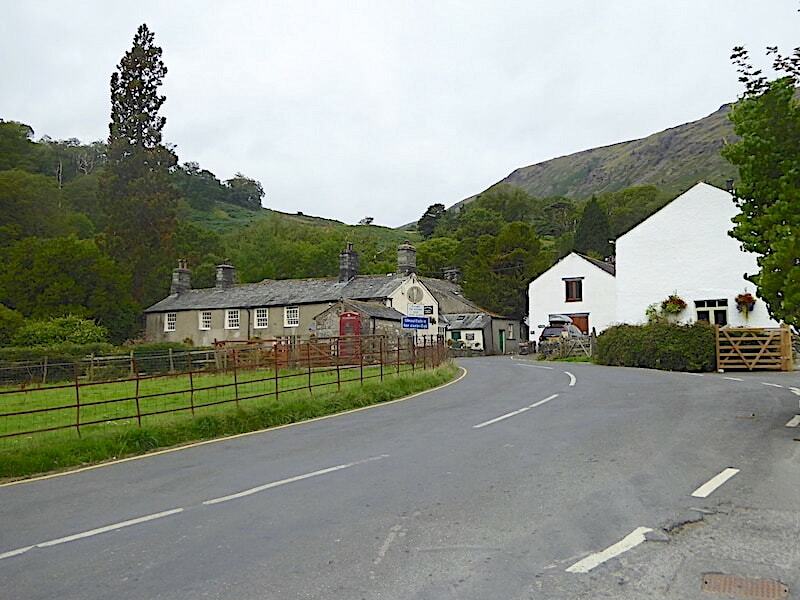 Looking back at the diminishing spoil heaps as we cross the Common, the mist has gone, the clouds are breaking up and we have a clearer view of Rosthwaite Fell in front of which is Thornythwaite Fell, both more often referred to as Bessyboot and Glaramara. 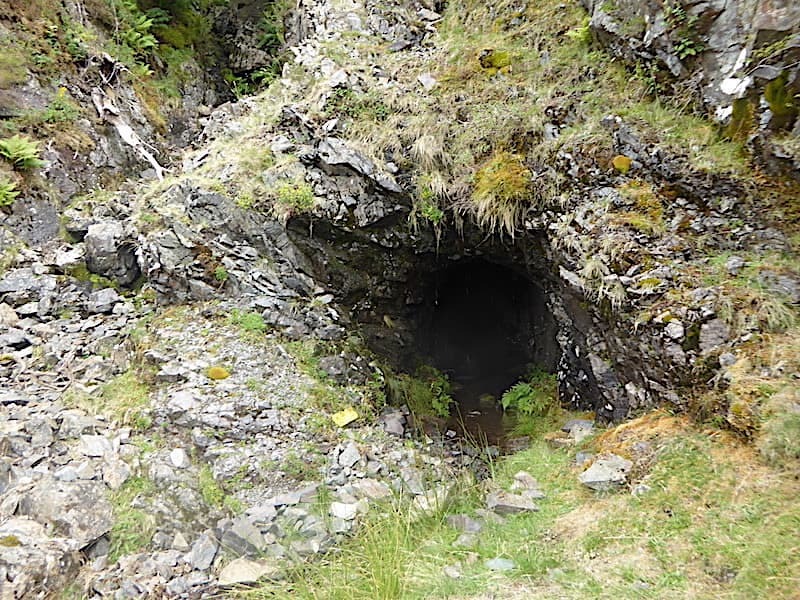 More wad mining evidence as we pass by another fenced off mine shaft. 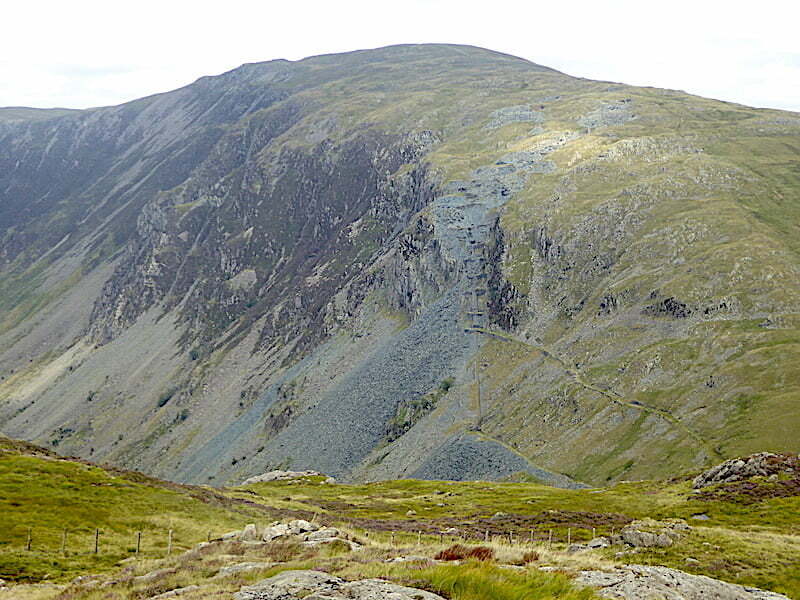 The Honister crags of Fleetwith Pike appear, along with more mining evidence, this time for the lovely green slate which is still being produced at the Honister Mine. 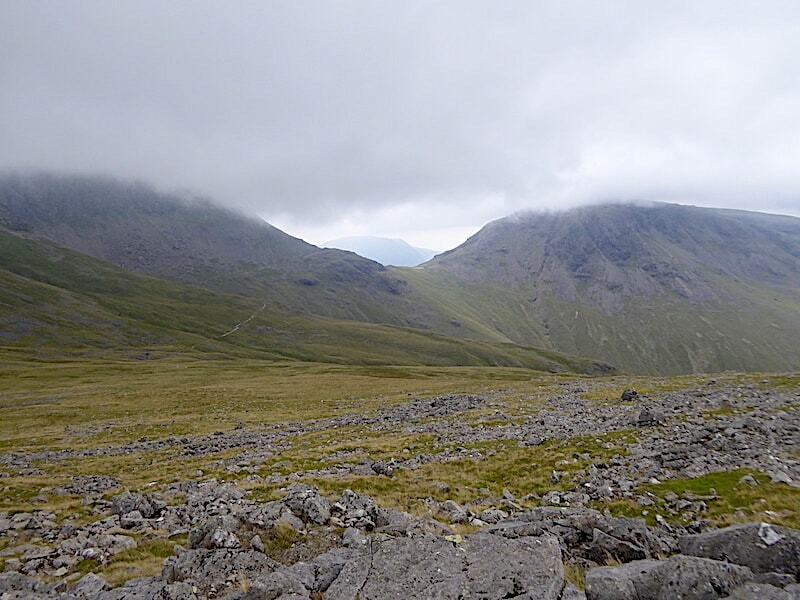 The cloud eventually lifts and finally we have a view of Great Gable above Green Gable. 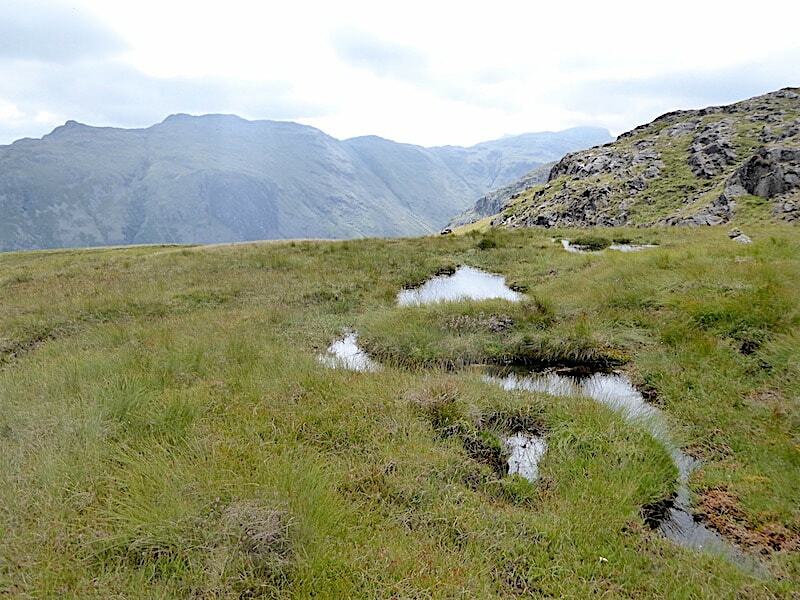 There are no footpaths across the Common so we have a lumpy trudge across the rough, and at times squelchy, grassland. Squelch hasn’t featured in our walks for quite a long time so the long dry spell is definitely over. 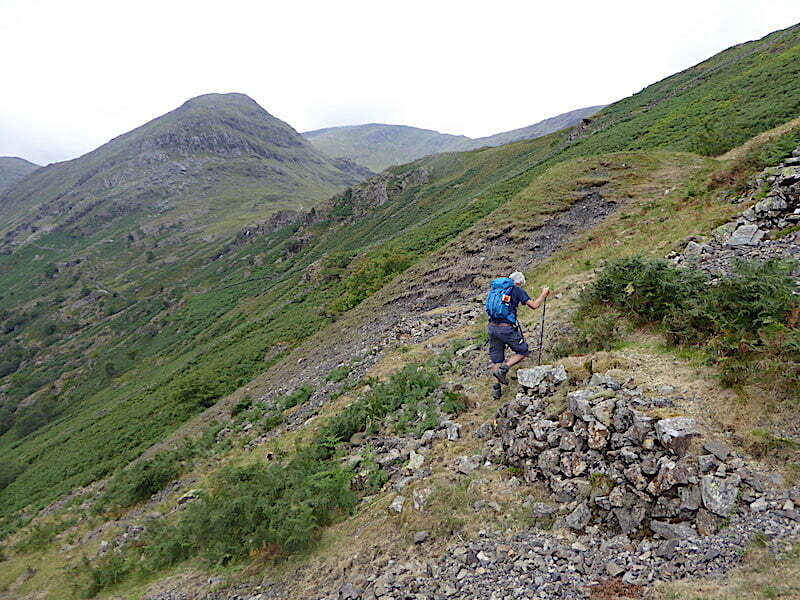 Grey Knotts comes into sight and we aim for the low points on the right skyline, although we could just as easily have picked our way through the crags. 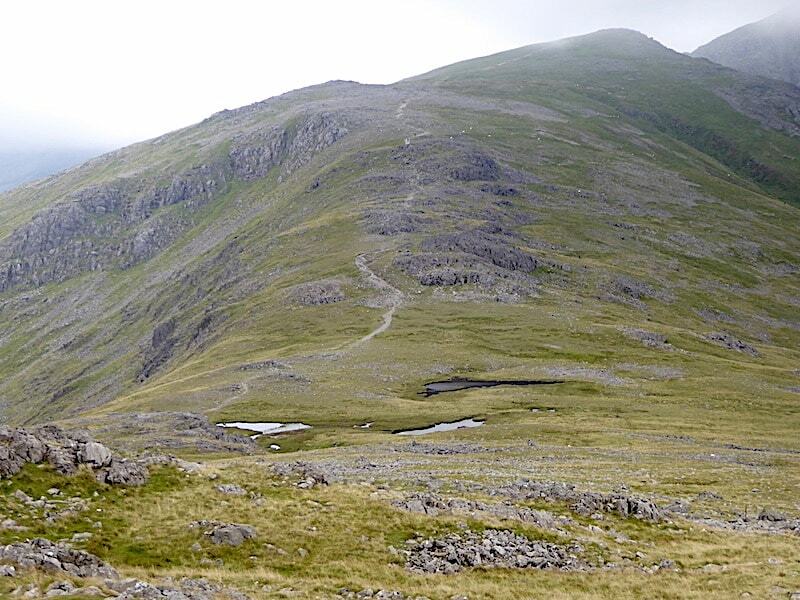 Looking back from the pools below Grey Knotts where the length of the Glaramara ridge is now clear of cloud, as are the higher fells beyond. Perhaps the friend we met in the lane will get some decent views after all. 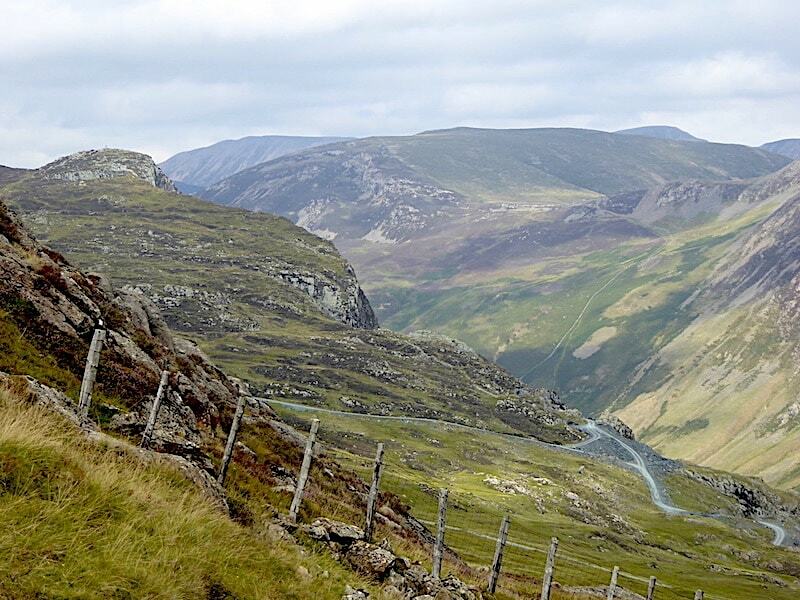 The fence coming up from Honister is visible in the bottom right hand corner of the shot although the path beside it is hidden from our view at the moment. 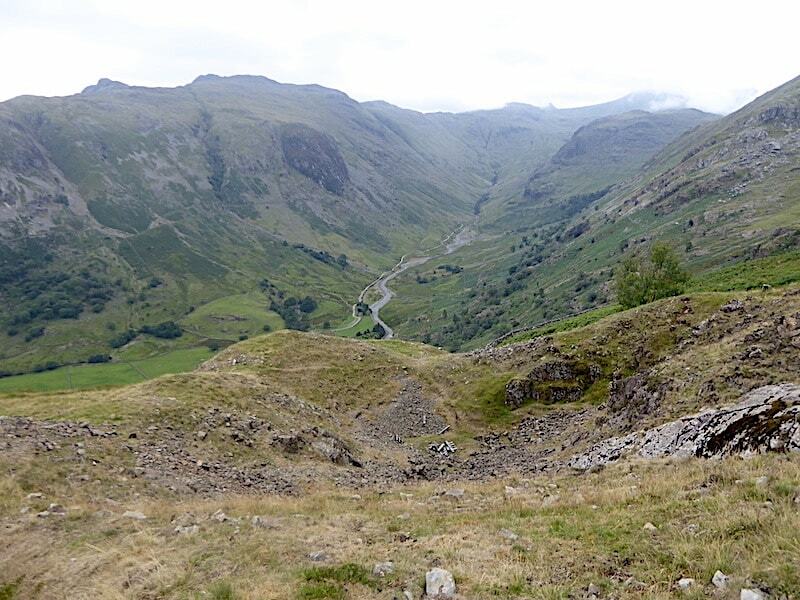 Across Honister Pass rises the enormous bulk of Dale Head, also showing evidence of mining. That’s another one of those places which ‘we should go and have a look round one of these days’. 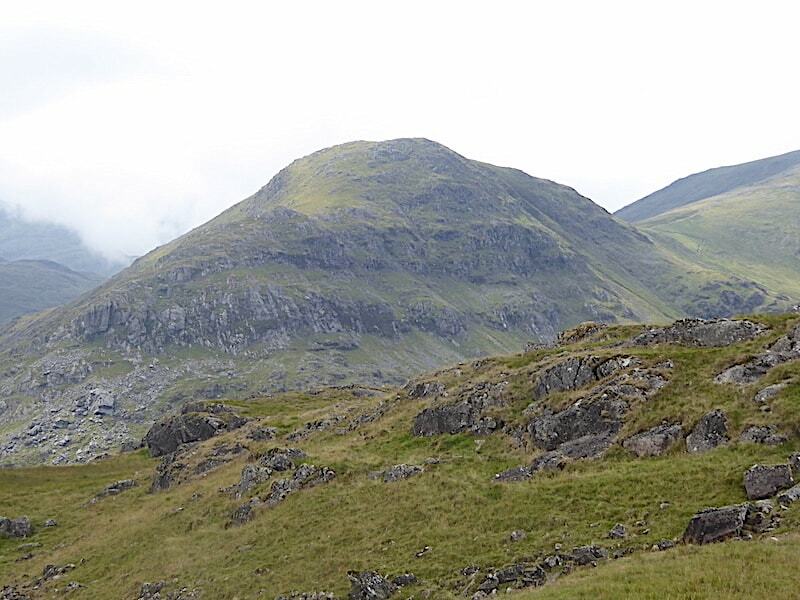 We join up with the path rising from Honister from where I take a look back at the ridge line of The Dodds now appearing on the right skyline. 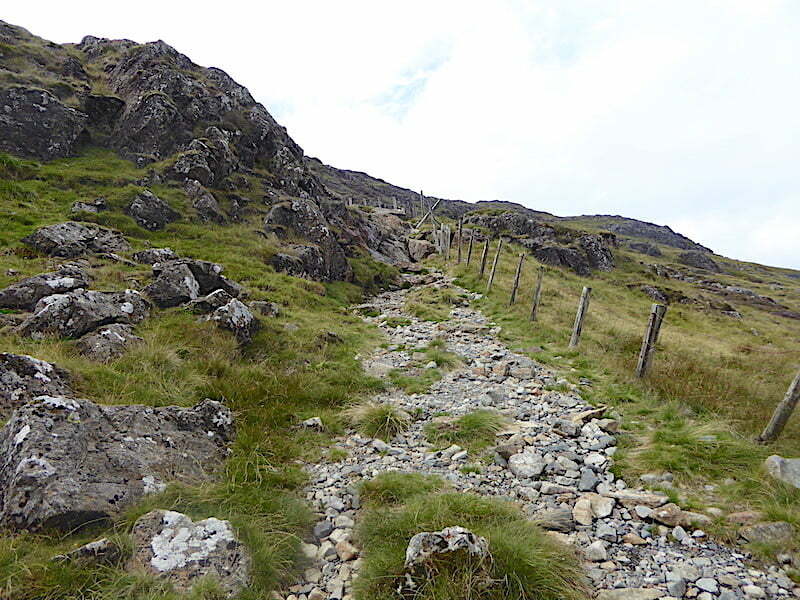 The view up the very loose and rocky path with a few brief scrambles here and there, although anyone with longer legs than me probably wouldn’t have needed to use their hands. 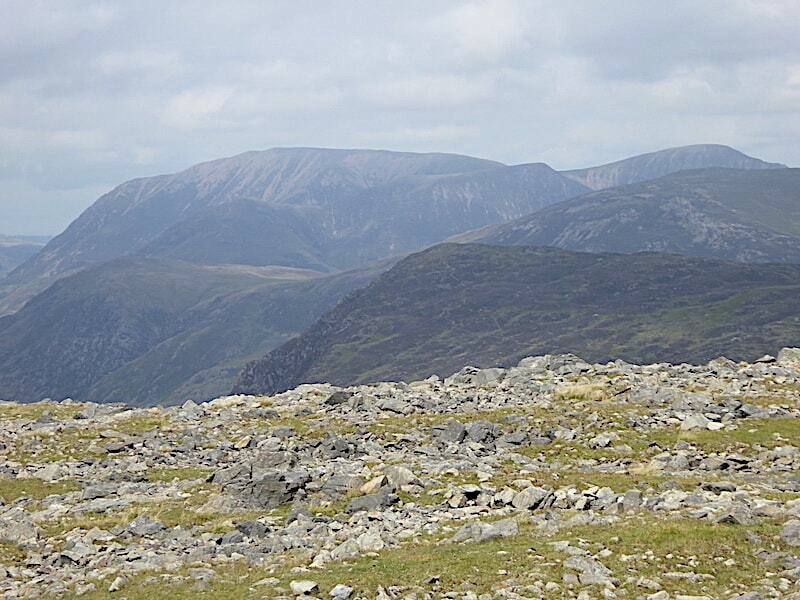 Perhaps we should have opted for threading our way over the grassy ledges of the crags instead. The cloud breaks even more and gradually we get longer sunny spells, some of which are landing on Dale Head and High Scawdel immediately opposite us. 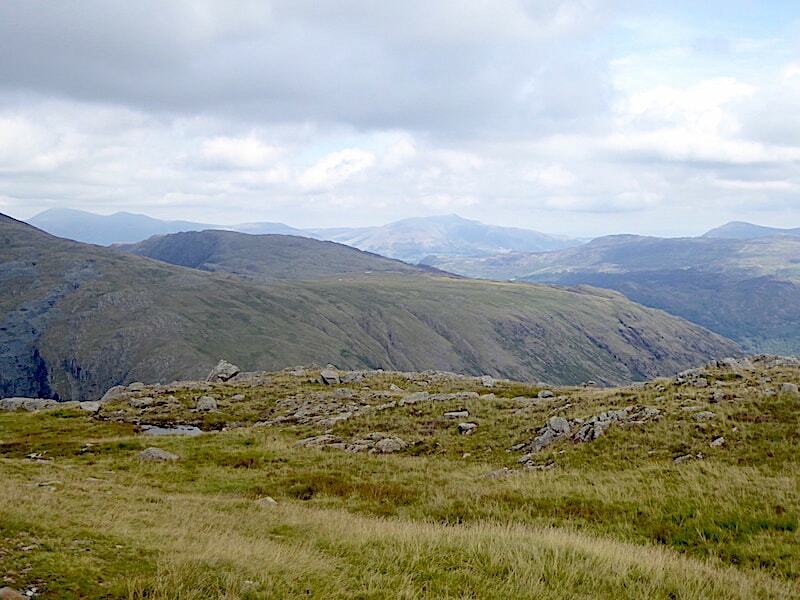 Peeping up in the centre behind them is the High Spy-Maiden Moor ridge to the right of which is the smoky-blue silhouette of Blencathra. 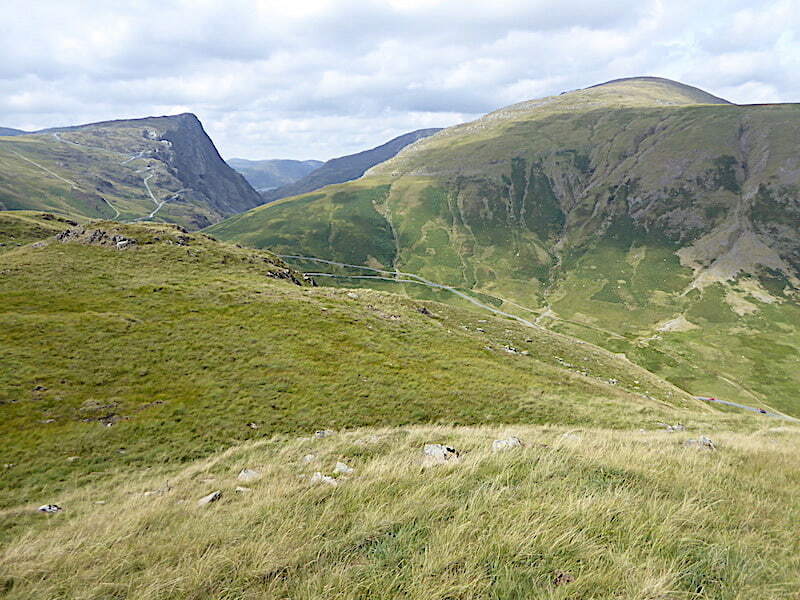 A brief pause as we pick our way up the steep and craggy path for a look over Honister Pass towards Grasmoor and Robinson. Its not quite so humid up here now, the air is fresher thanks to a brisk breeze, but the steepness means that its still warm work. 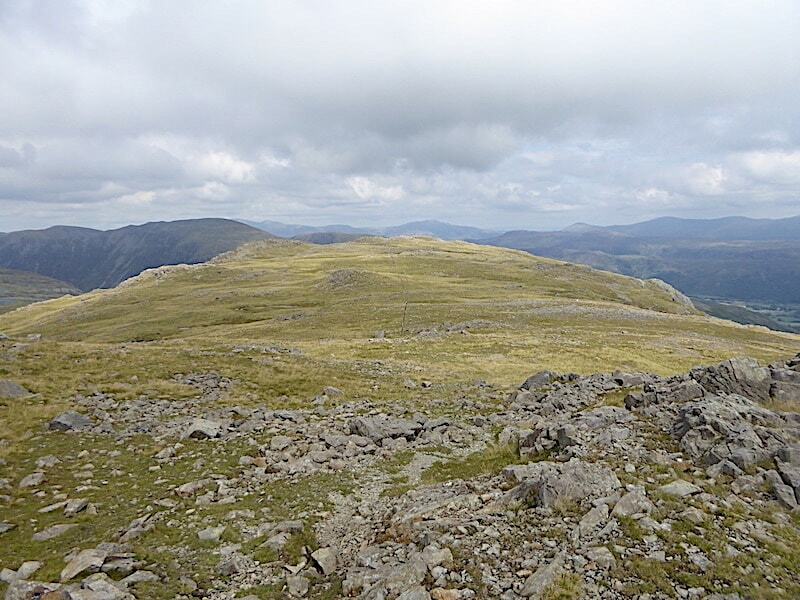 Not too far from the top now and although there’s still some haze around we have a skyline view of Skiddaw, Blencathra and Clough Head behind us. 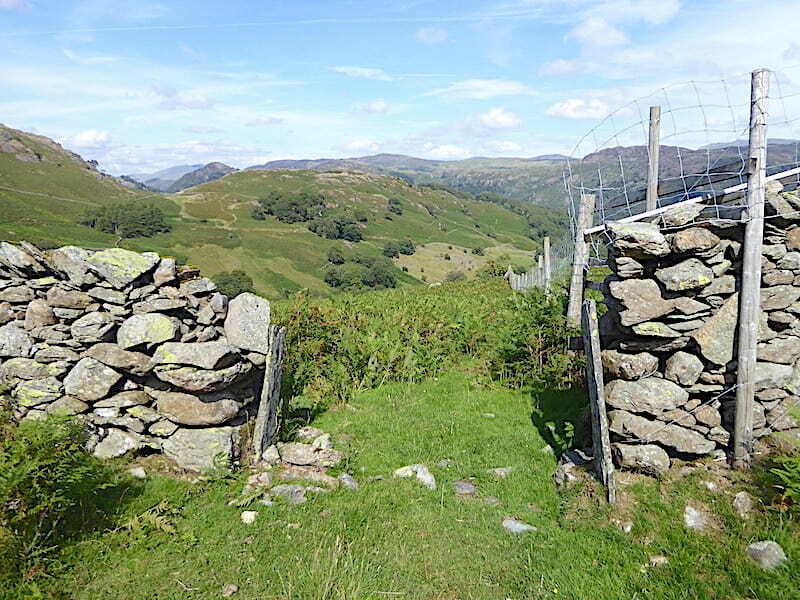 We cross the stile and a little meander around the outcrops …..
….. brings us out on the eastern top of Grey Knotts. A couple of weeks ago those pools would probably have been dried out. 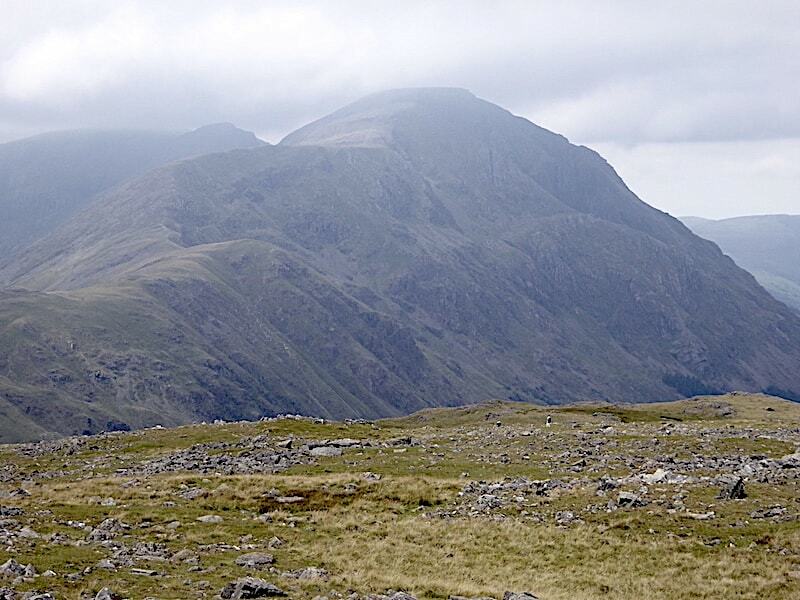 Across the col between Base Brown and Green Gable we have a clear view of the tops of Bowfell and Esk Pike, Great End and its near neighbours are not faring so well, but over on the extreme right Scafell Pike has just appeared. Our pal will have something of a view after all. 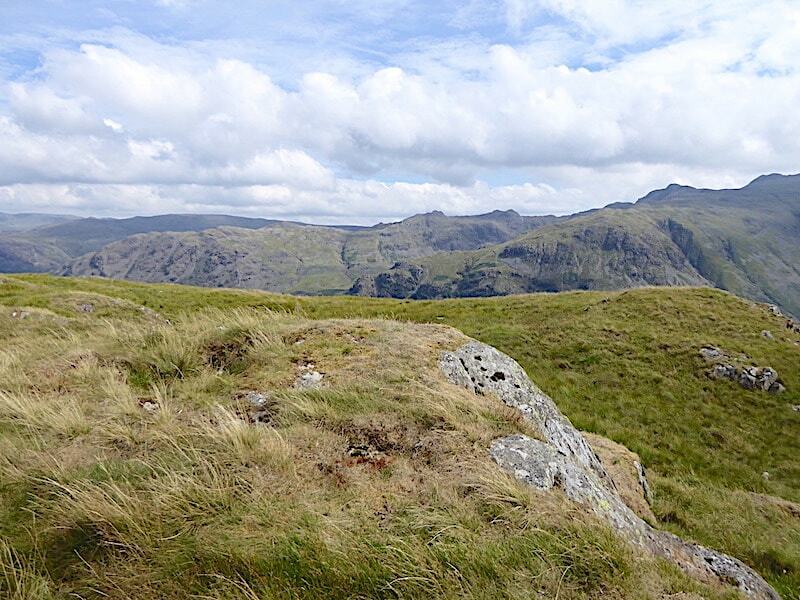 Its on the breezy side but the spell of warm sunshine was very enjoyable as we sat taking in the views. 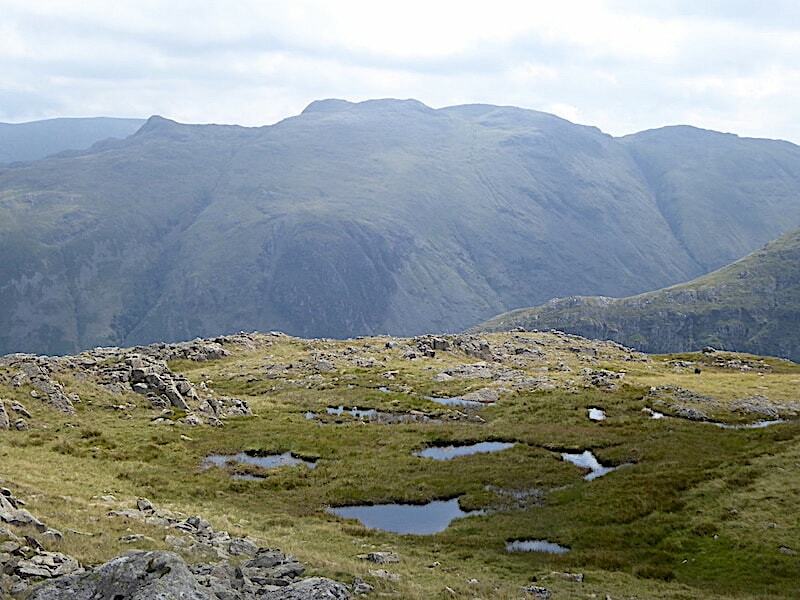 From the eastern top a closer look at Glaramara now that some of its features are clearer, the peak of Comb Head to the left followed by the craggy summit, with the bulbous nose of Hind Crag below that. 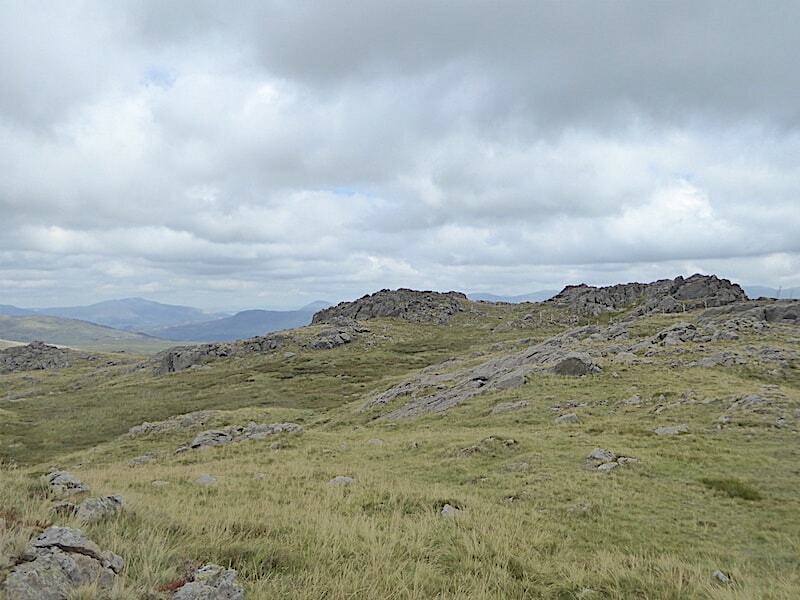 The rocky lump across the middle foreground is the western top of Grey Knotts which is where we’re off to next. 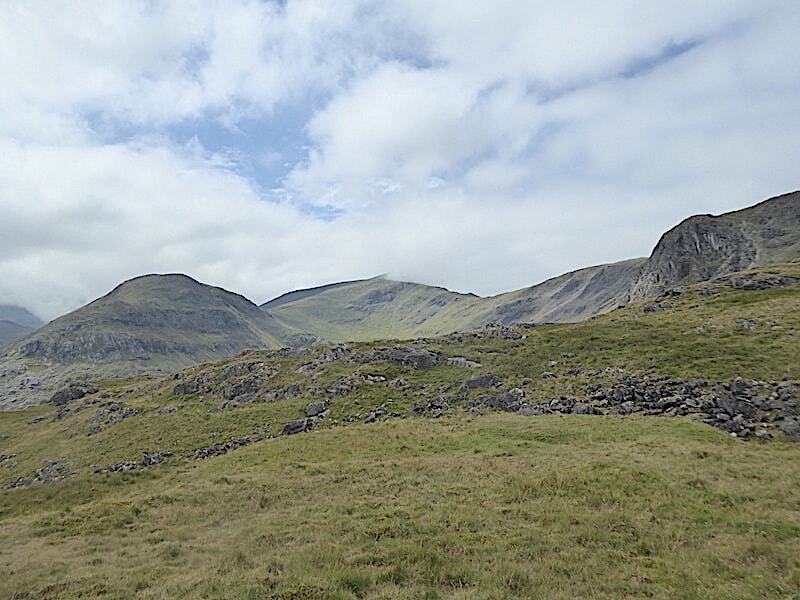 Behind that is the much larger rocky lump of Pillar where we off to last week. 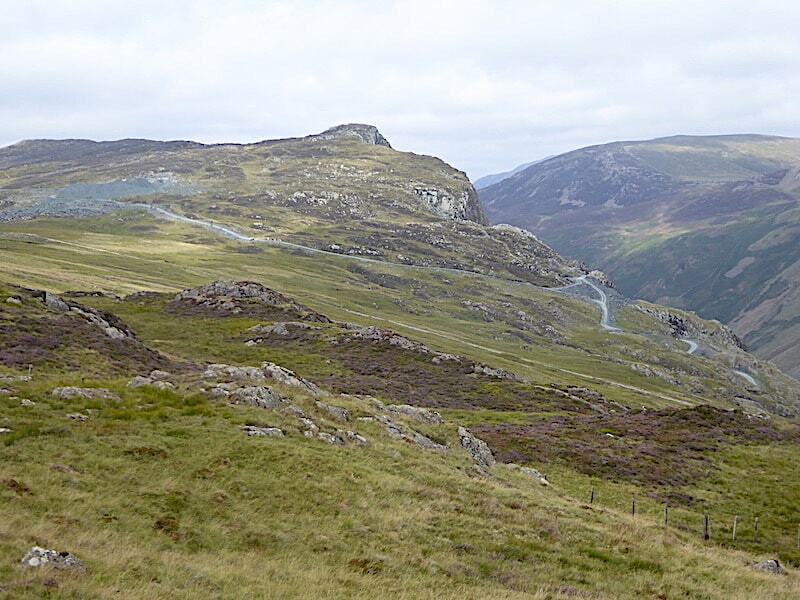 Across the Honister Pass is the Dale Head, Hindscarth and Robinson family group …..
….. while on the other side of us are Base Brown, Green Gable and Great Gable. 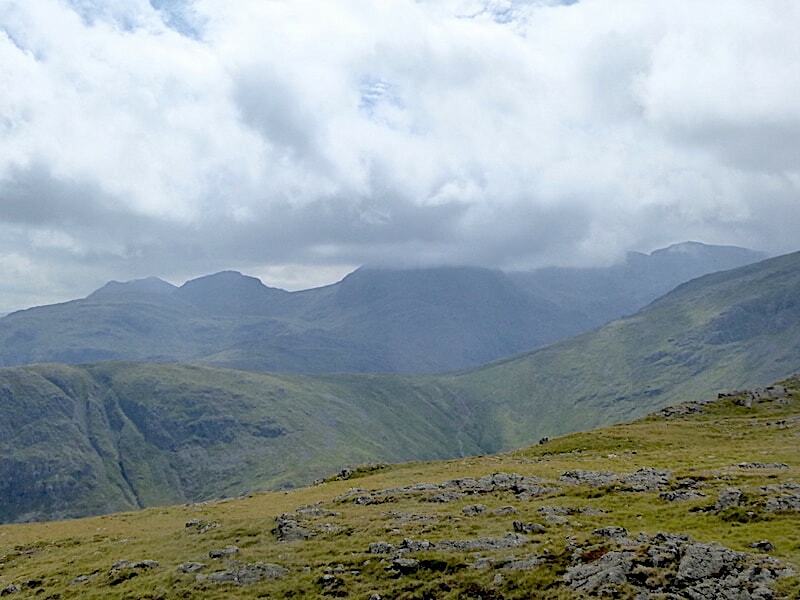 The cloud is still cluttering up the skyline view towards the Scafell group. 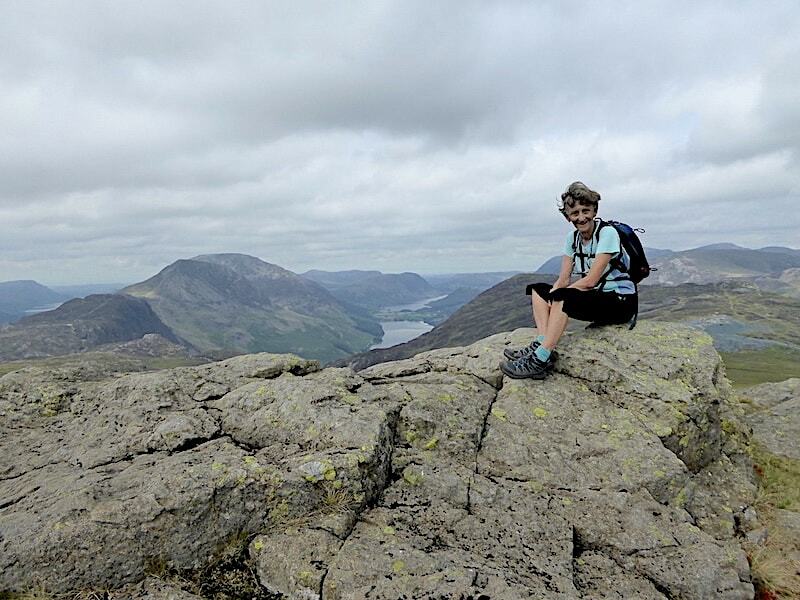 We crossed over to the western summit with its superb view along Buttermere and Crummock Water …..
….. with a less than superb view of someone having a bad hair day atop the boulders. Why does the wind make more of a mess of mine than it does J’s? From the photos I’ve seen one of my grandmothers had a mop of unruly hair too so I’m blaming her. 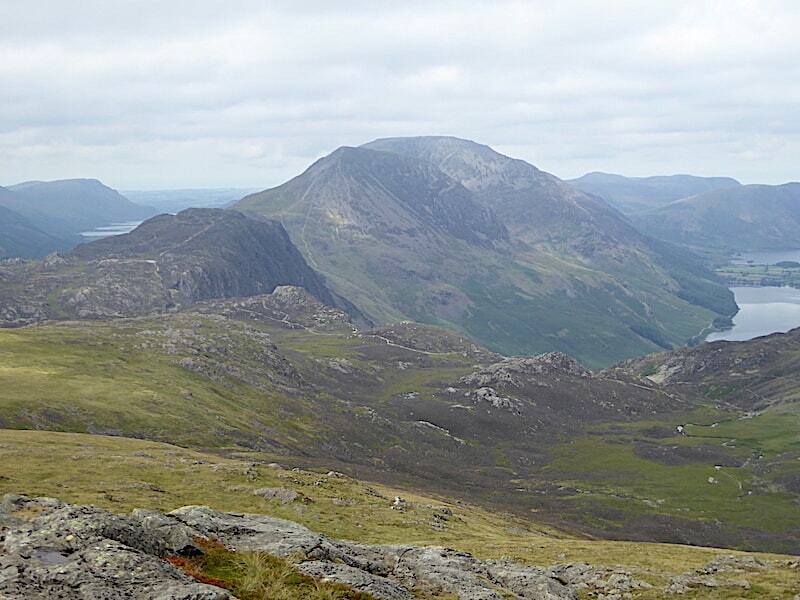 From the western summit a look over to Haystacks and the High Stile ridge followed by …..
….. a look back to the eastern summit area. 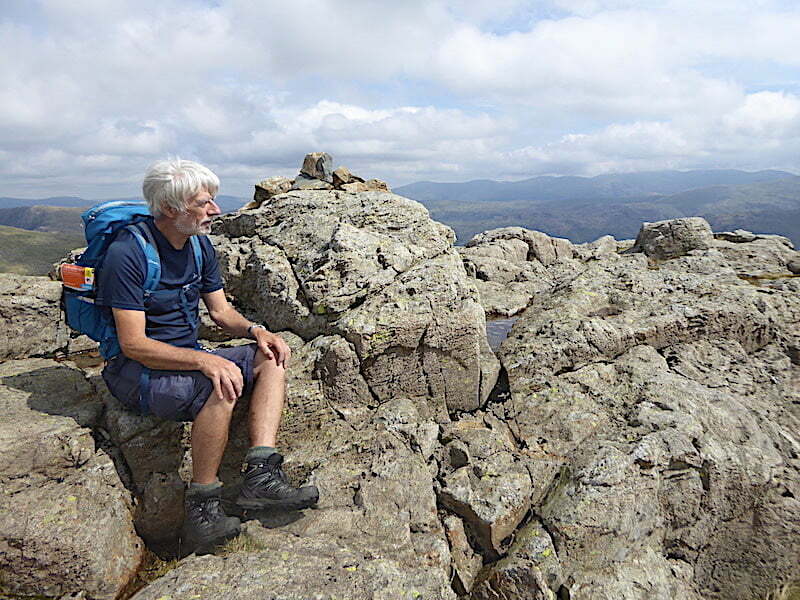 The clouds appear to be heavier than they really were and after a refreshment break we carried on …..
….. across the ridge and made our way over to Brandreth. Keeping to this side of the fence kept us out of the damp areas on the Glaramara side of the ridge’s tarn. 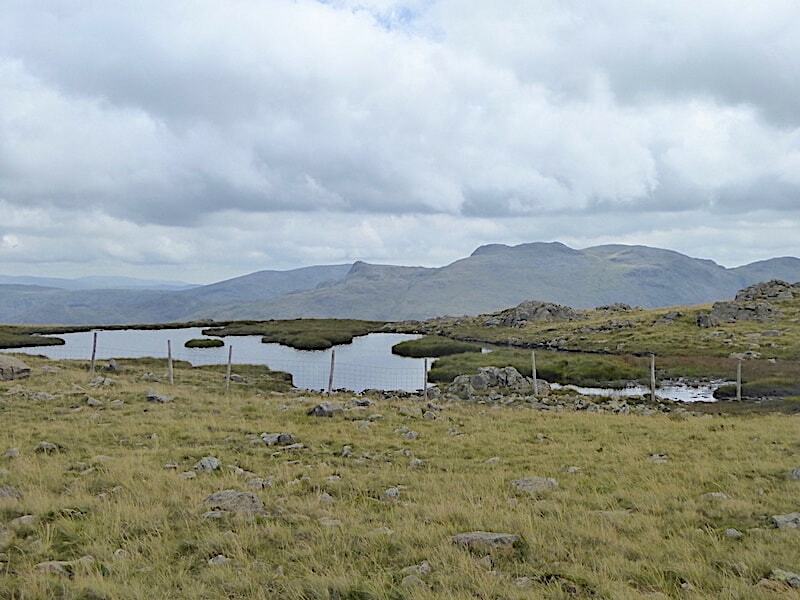 Once past the end of the tarn we crossed over the fence, where I took a quick look back to the eastern summit before we continued. 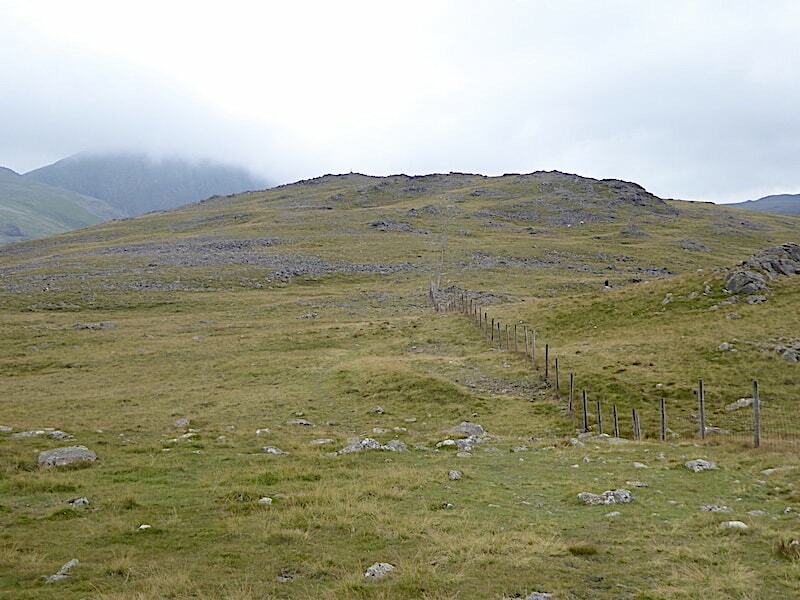 Ahead of us is the straightforward ten to fifteen minute stroll across to Brandreth …..
….. where the old fence posts are still adorning the summit area, where they were left who knows how long ago. This is the generally accepted summit although the gps gave us a couple of higher points, one of them being the rocky mound on the extreme right. The other one is not in the shot but is over to the left. 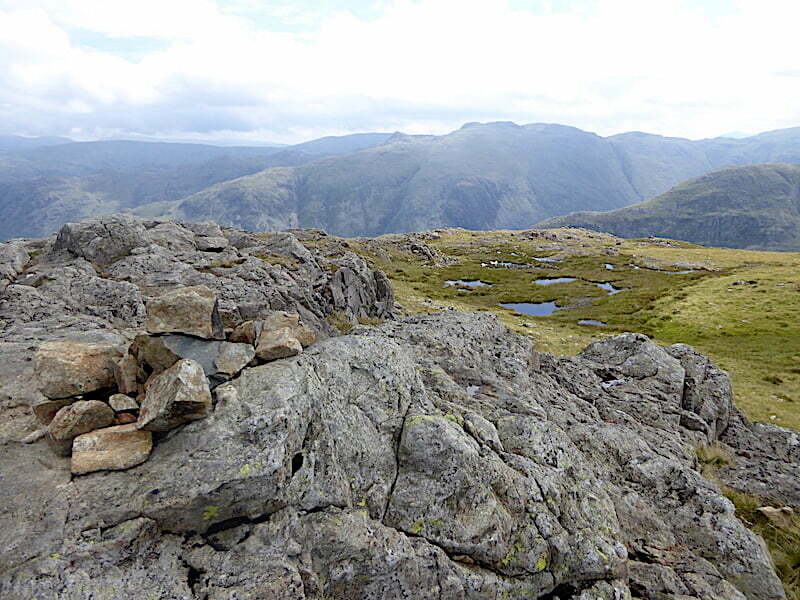 Just a few walkers were up here, a largish group who were settling down for a food break on the Gillercomb side, with the rest being lone walkers all of whom were too far away to have a chat with. 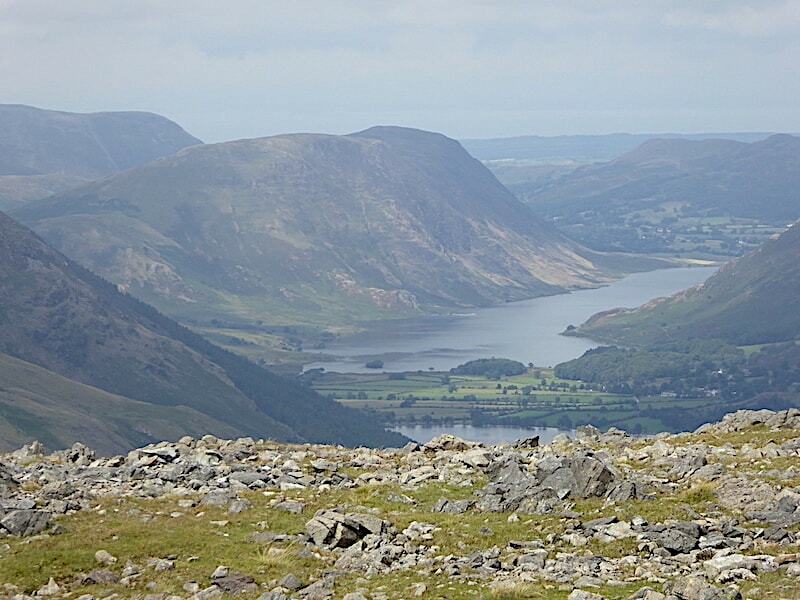 I had a short stroll westwards for this view of Mellbreak alongside Crummock Water …..
….. and a little further to my right for this view of Grasmoor and a few of its neighbours. Looking back to my left for this view of Pillar and remembering the ‘bite size chunks’ approach we adopted as we climbed it last week. It was very much hotter then that it is today. 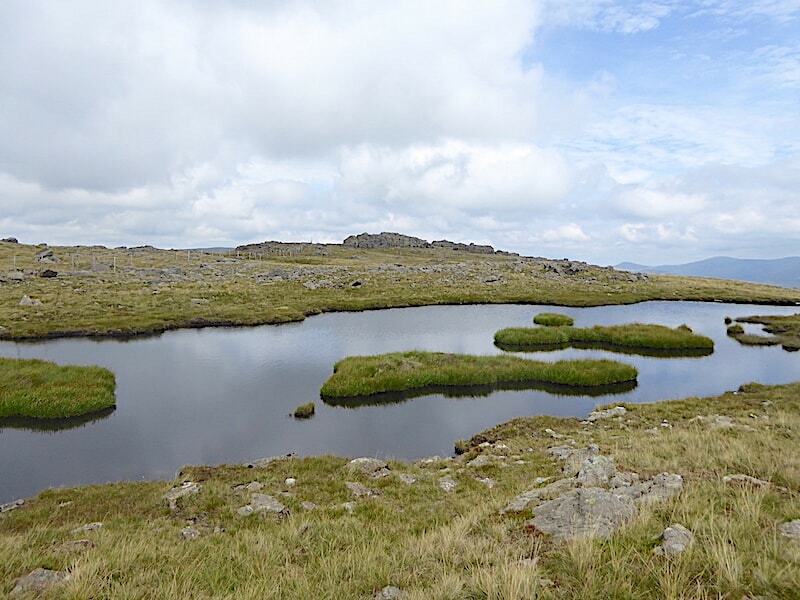 A short stroll to the southern end of Brandreth for this view across the tarns at Gillercomb Head and the path rising up to Green Gable …..
….. and then a little more to my right for this view of Great Gable and Kirk Fell both being clipped by some low cloud. 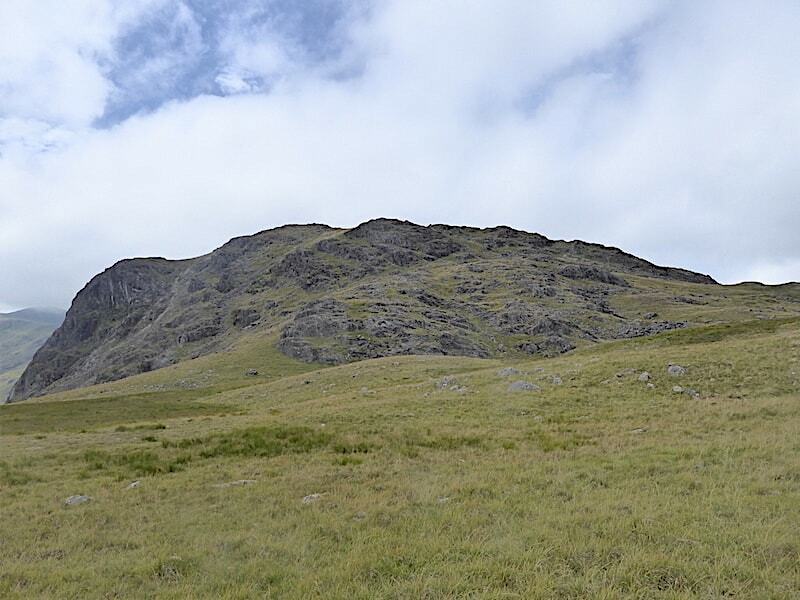 We begin to make our way back across the ridge to Grey Knotts …..
….. and from there we retrace our steps back down towards Seatoller Common. 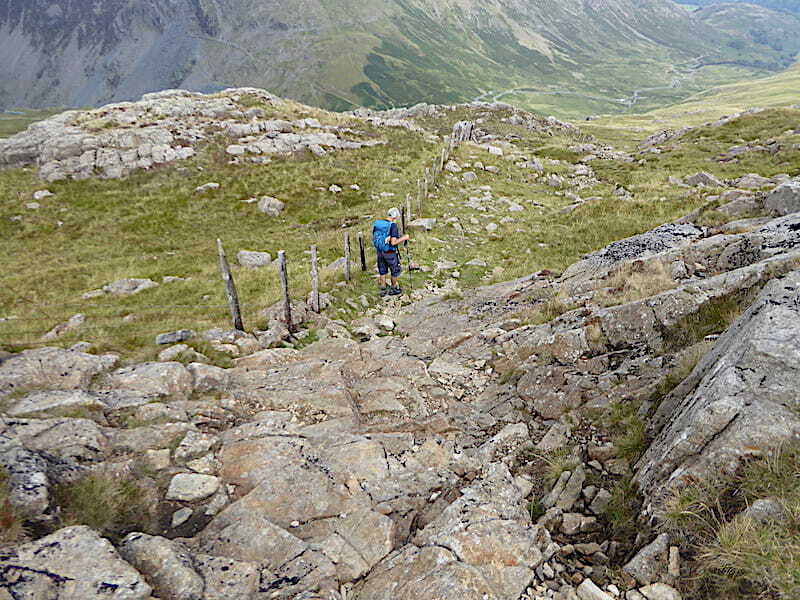 The path is very steep and loose in a few places so J takes it very steadily to avoid any jarring on the pinned and plated left foot and ankle. Weight taken on the good right foot with assistance from the poles, followed by an ouch free placement of the left one. 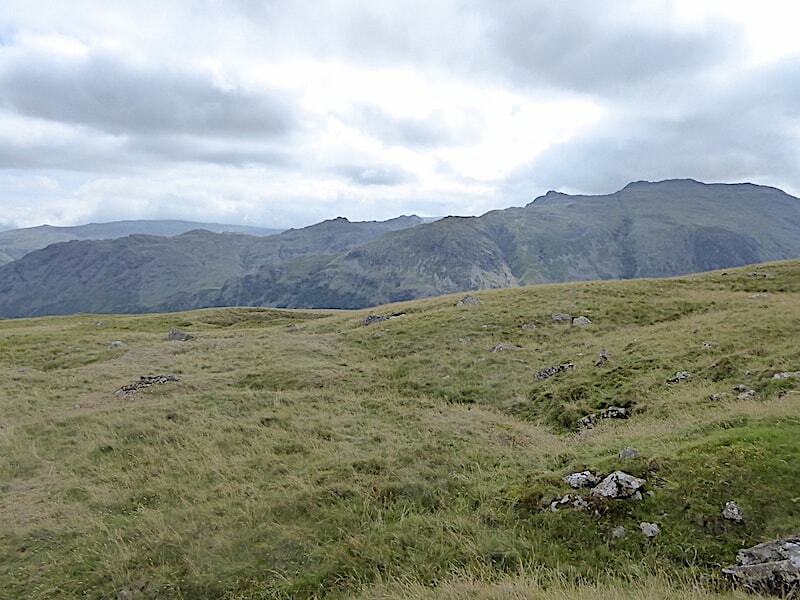 We leave the path exactly where we joined it, having left a marker before making our way up earlier, and began the steady tramp across the Common. There’s no point in looking for a path, there isn’t one, so once again we just make our own way over. 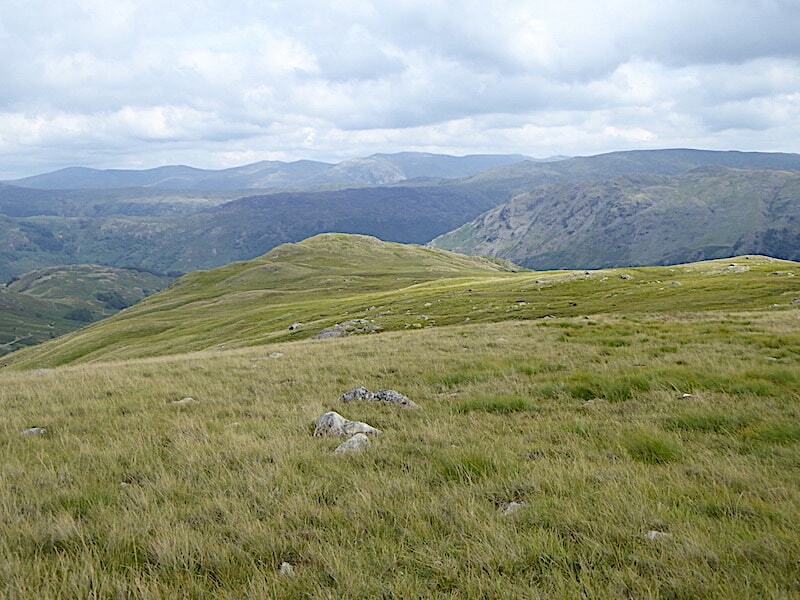 We’re heading for the high point at the far end of the Common. 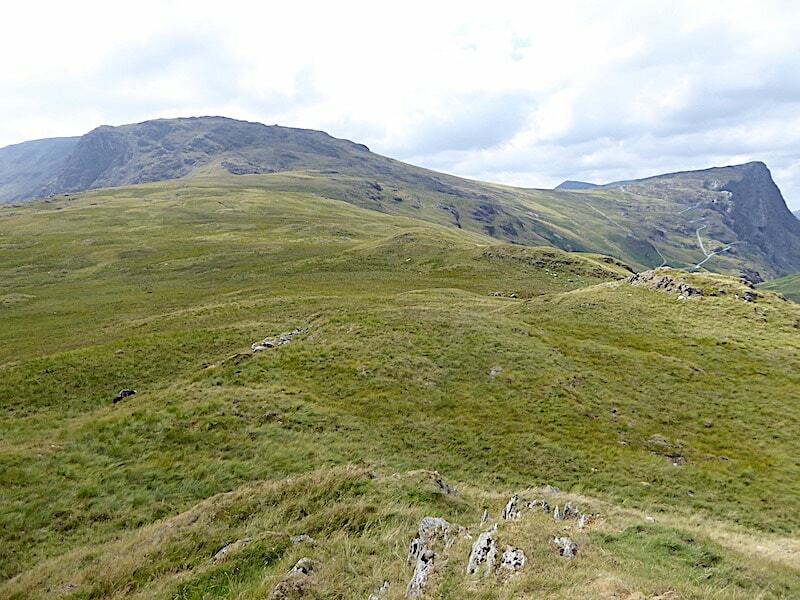 Sunshine lights up the lower crags of Thornythwaite Fell, with Bessyboot, the accepted summit of Rosthwaite Fell behind them. 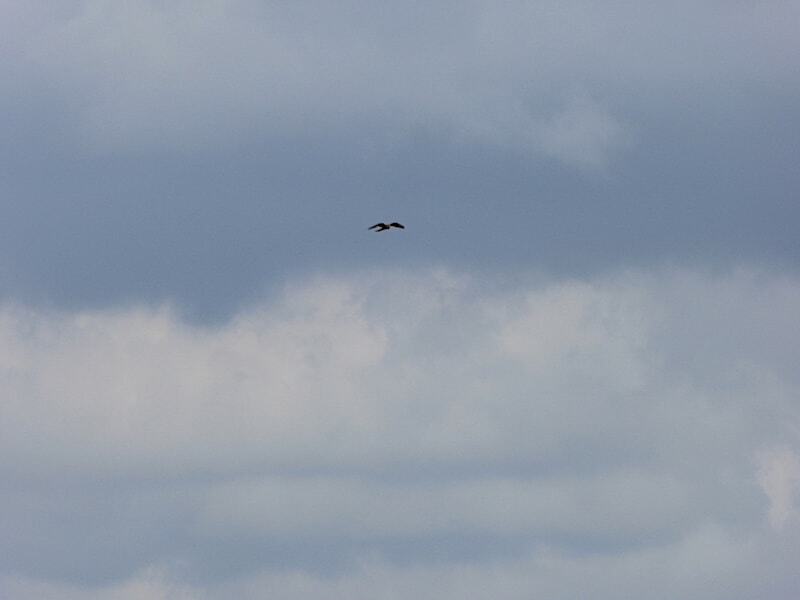 A very long zoom to catch a glimpse of a distant buzzard which, with the naked eye, initially resembled a hang glider only to find it wasn’t as the camera zoomed in. There it was, hanging perfectly still, high above the fells with its head down and its eyes scanning the ground for prey. Superb eyesight, a lightweight skeleton, a few muscles and some feathers, all combined to produce this amazing spectacle which always has me spellbound no matter how many times I witness it. There was no sudden downward swoop so the pickings must have been a bit thin and after a minute or so of hovering the wings were flattened, and with the slightest of movements it effortlessly peeled away and disappeared from our view. 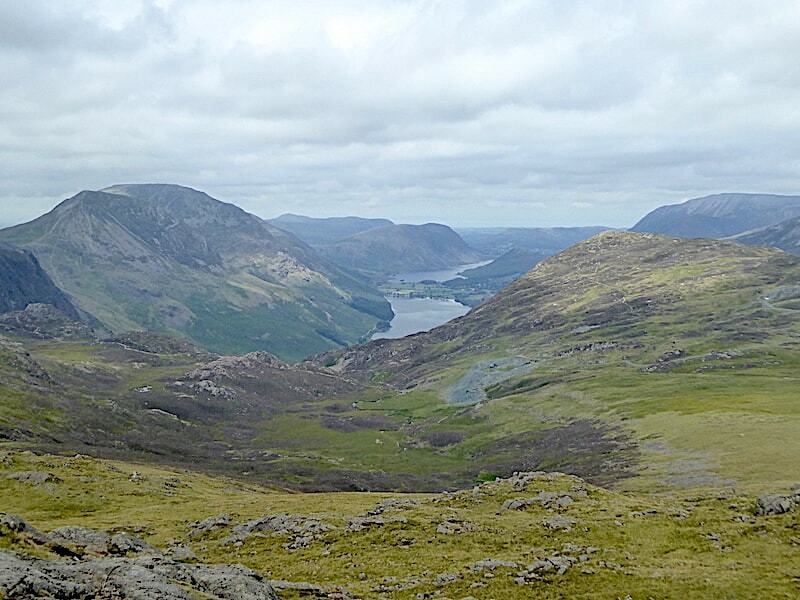 A look back to Grey Knotts and Fleetwith Pike as we reach the high point of Seatoller Fell. 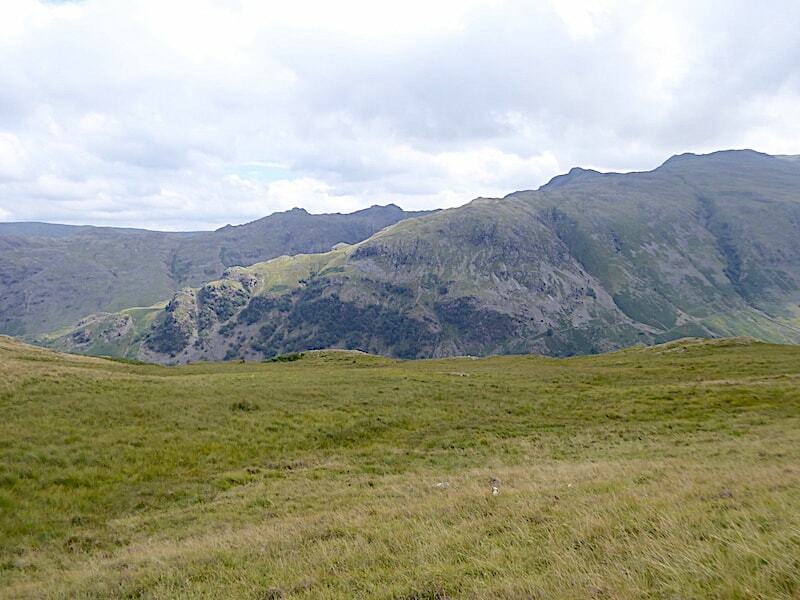 A very enjoyable walk down despite the rough and uneven ground and the occasional moist patch. 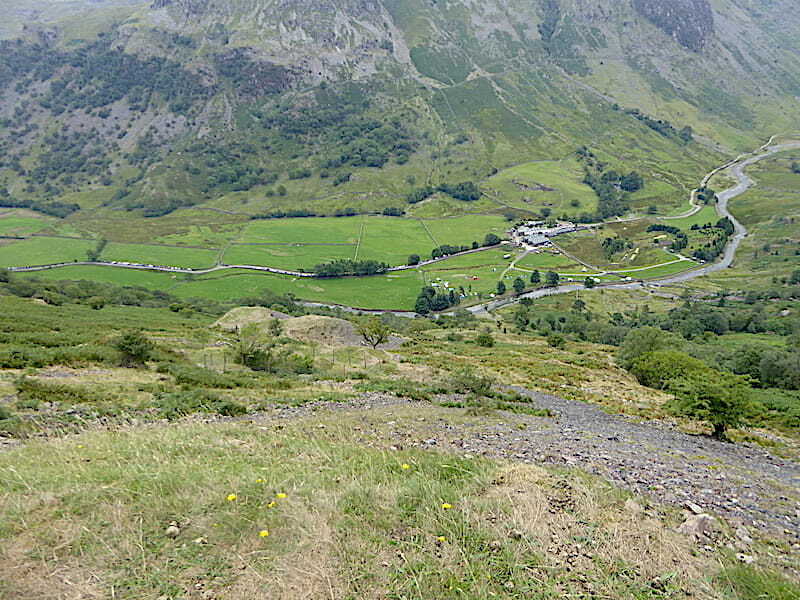 From the same vantage point a view of the road up to Honister carving its way between Fleetwith Pike and Dale Head. 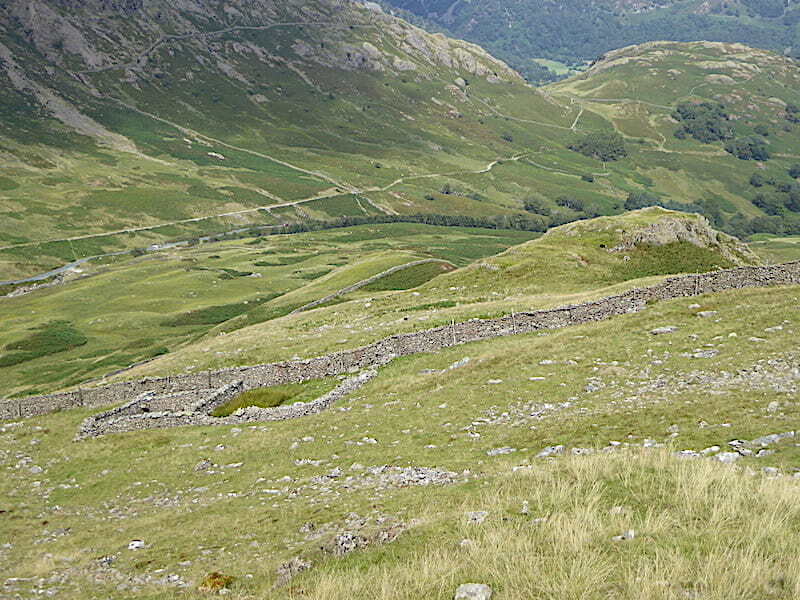 This grassy rock marked the highest point of the fell from where …..
….. there was a good view down to the double sheepfold beside the wall, together with another view of the Honister road where plenty of cars were making their way up and possibly heading for a Sunday outing to the Honister Slate Mine. 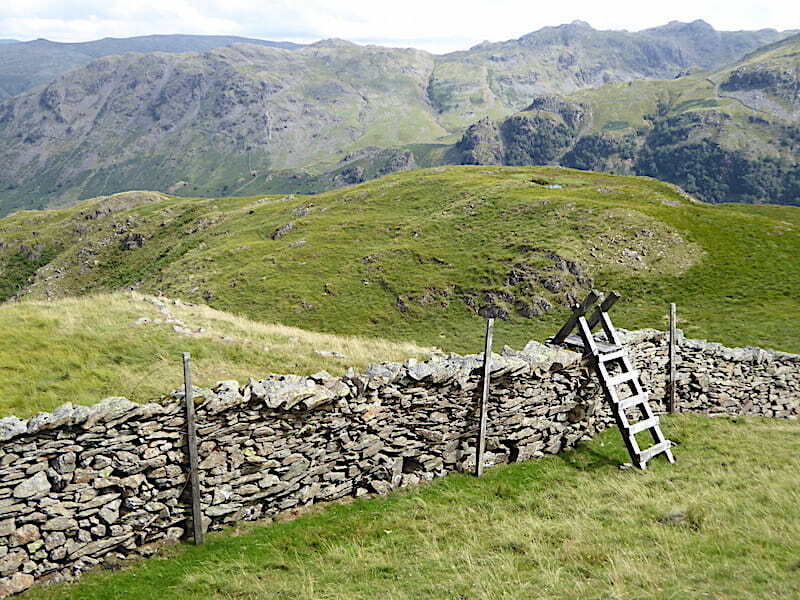 We drop down from the high point and cross the wall via the ladder stile, a new rung replaced an old one which had been discarded behind the stile. 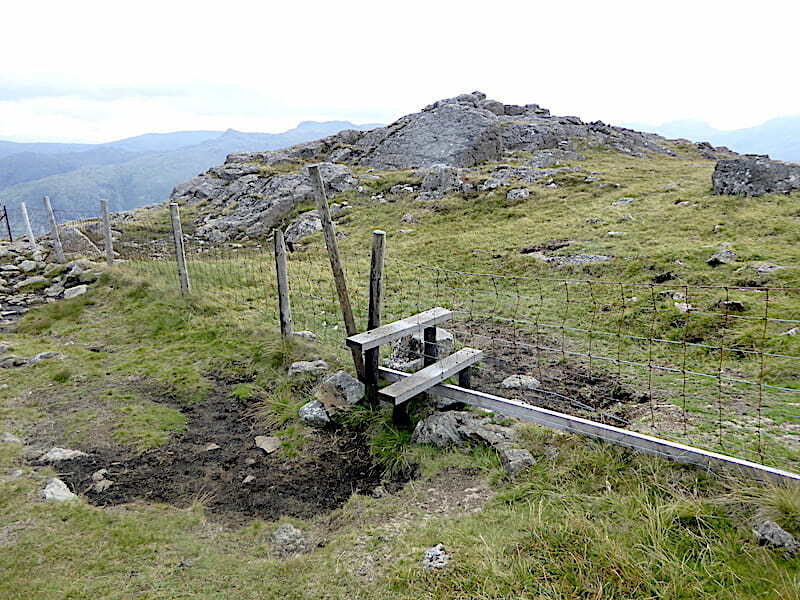 On the other side another rung replacement with the old and broken one once again being left behind the stile. 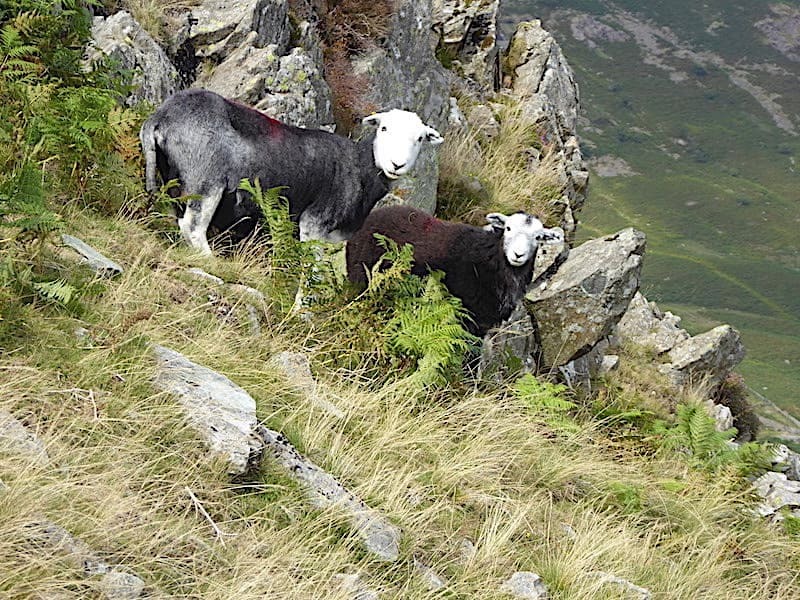 A steep drop down from the wall during which we surprised these two Herdwicks who were no doubt enjoying their solitude and some Sunday lunch until we came clomping along, no wonder we are getting stared at. 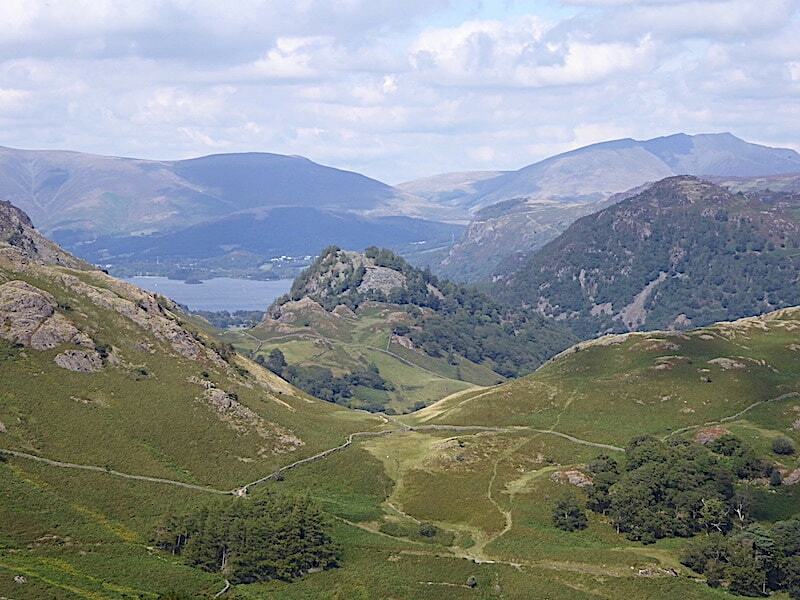 Still dropping down Seatoller Fell with a lovely view of Castle Crag and part of Derwentwater below us. 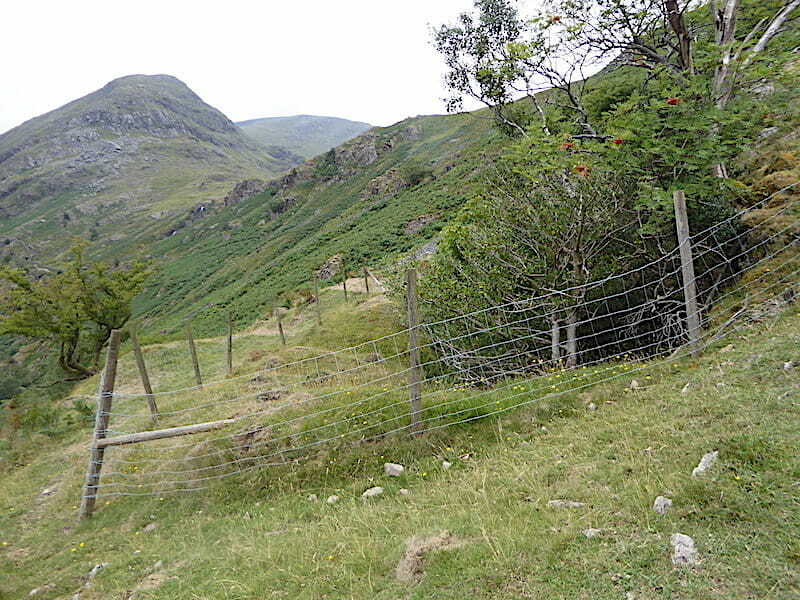 Having already fought our way through an ocean of bracken down to this point we now have another mess of it to deal with as we pass through this gap in the wall. A hot and sweaty interlude once more as we fight our way back down to Seatoller. I must have re-tied my bootlaces half a dozen times by the time we were through it. 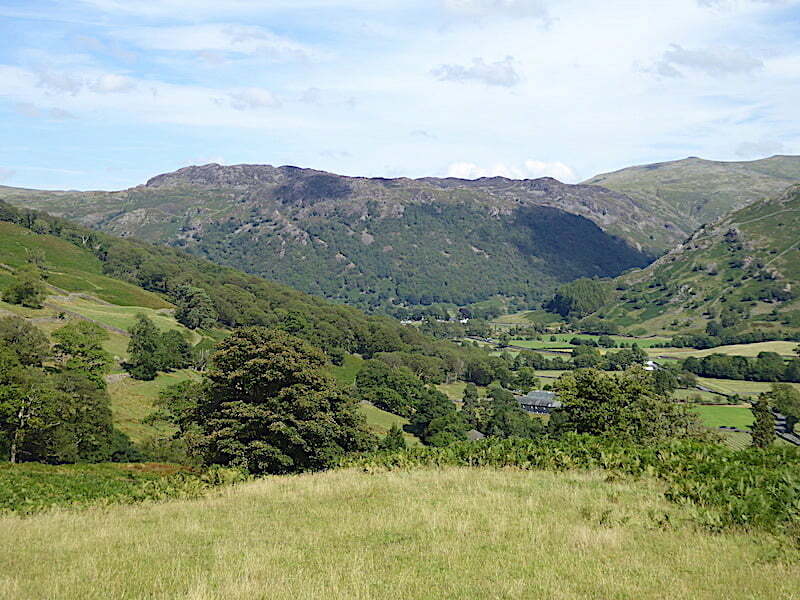 We emerge from the tangle of bracken and onto the open grassland again with Rosthwaite Fell for company on our right. We never imagined that the dour and gloomy morning we started out with would turn into such a lovely sunny afternoon. 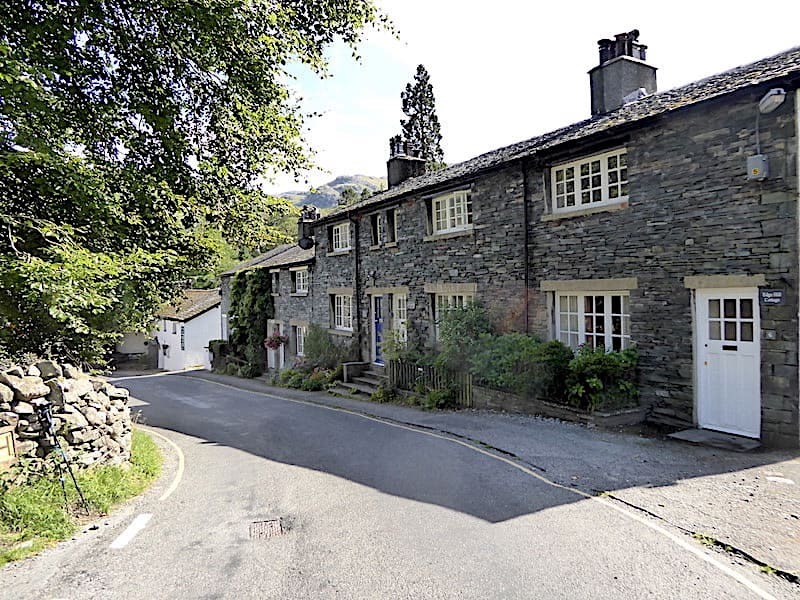 Great Crag is directly opposite us as the rooftops of Seatoller village begin to appear, and from here we have only a very short distance to walk …..
….. until we are back in Seatoller. At the bottom of the hill is the car park so we’ve just about reached the end of today’s walk. It was only going to be an exploration of the wad mines so the late morning break up of cloud proved to be an unexpected bonus. It was lovely to have the sunshine back again after quite a few cool and cloudy days lately. 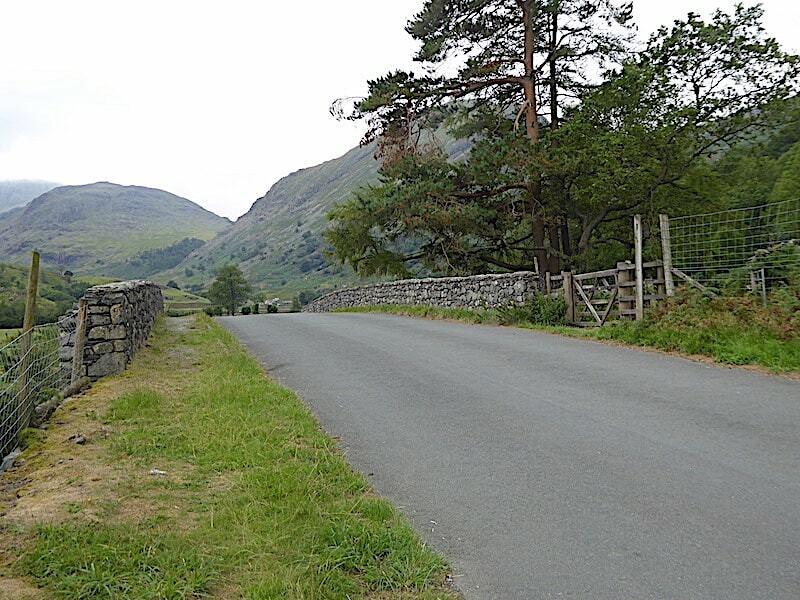 As we walked back to the car the traffic coming down from Honister was constant, some of the drivers showing little regard for the narrowness of the road or the peace and quiet of the village. Why is everybody in such a rush nowadays?